Yokoji castle / Yokochi castle (横地城) is located over the height at the western edge of Makinohara height, which spreads from north to south along with Oigawa river at the eastern end of Totomi province (western part of Shizuoka prefecture). 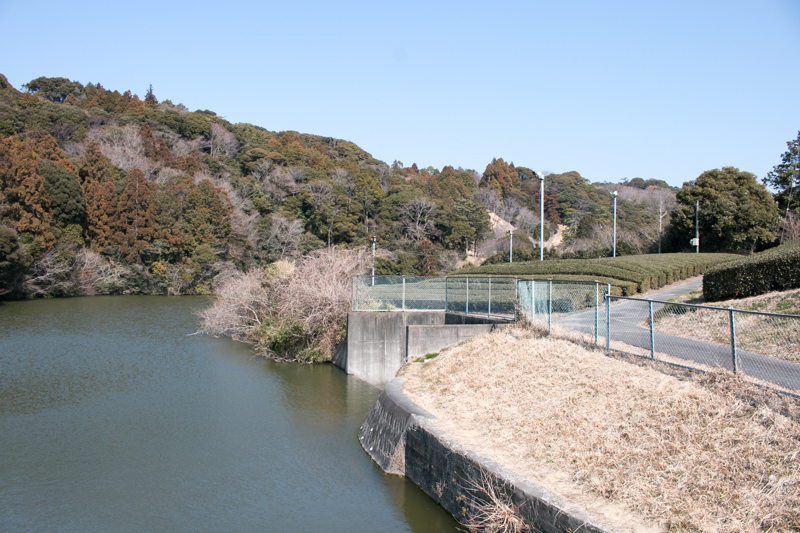 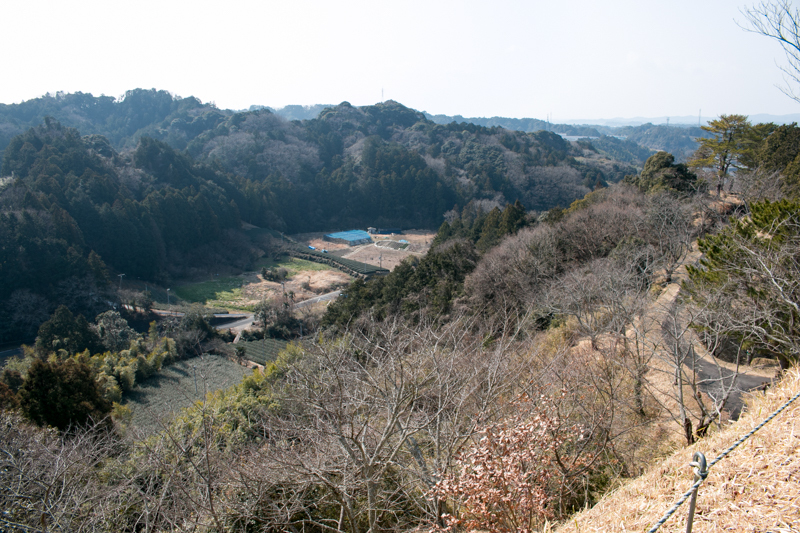 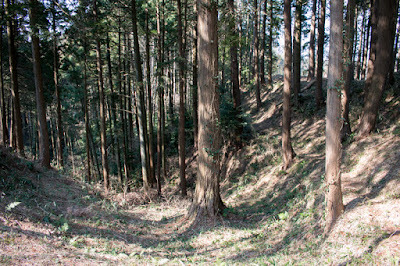 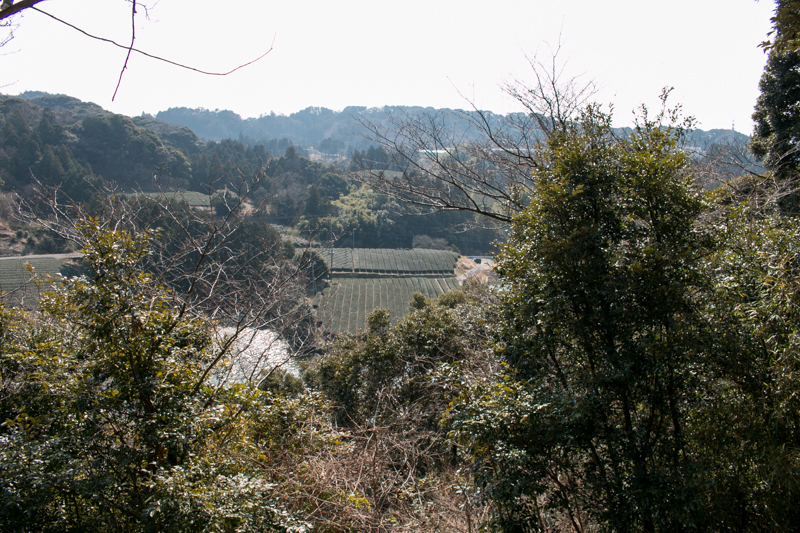 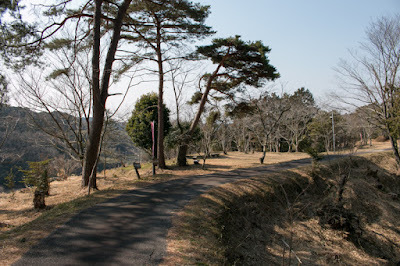 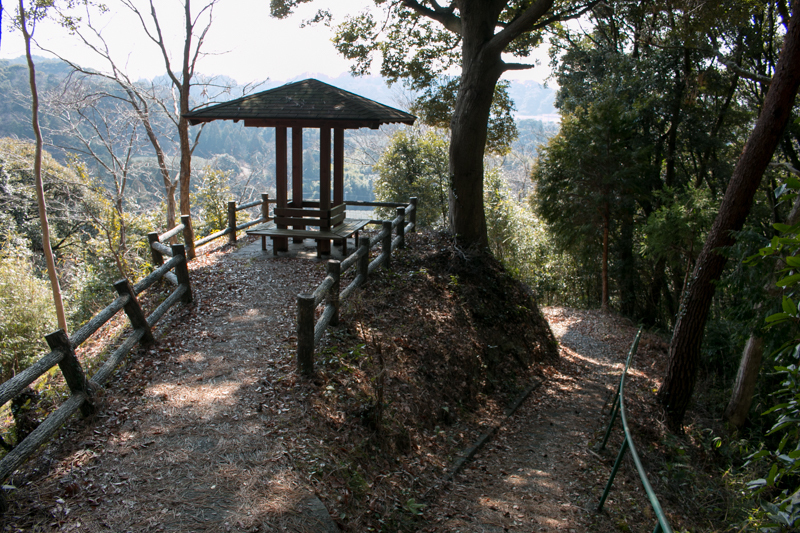 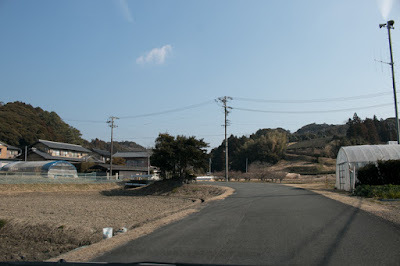 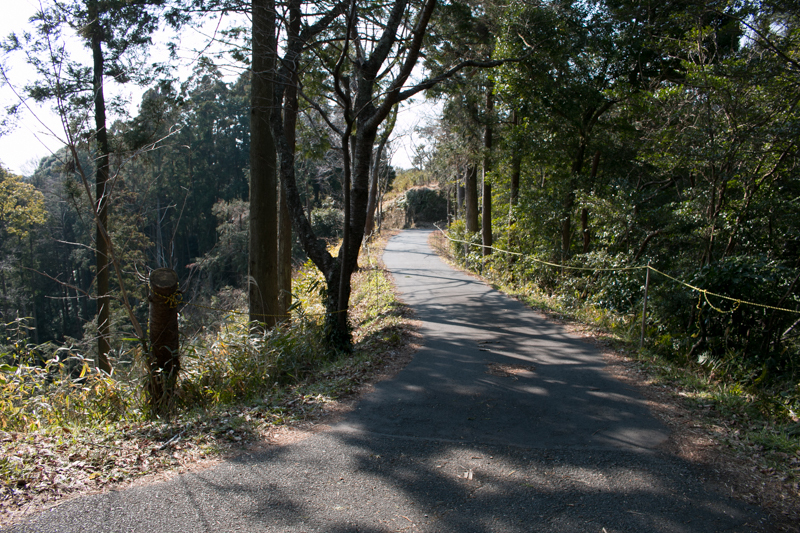 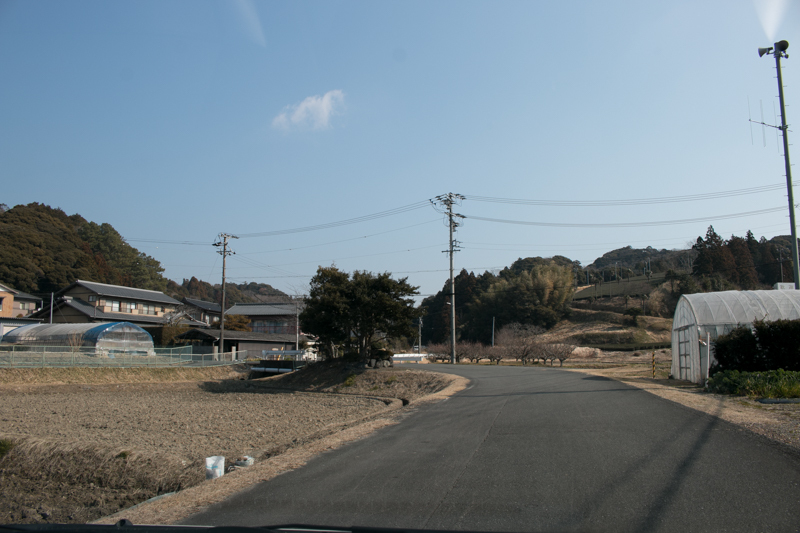 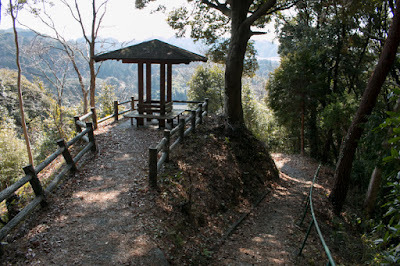 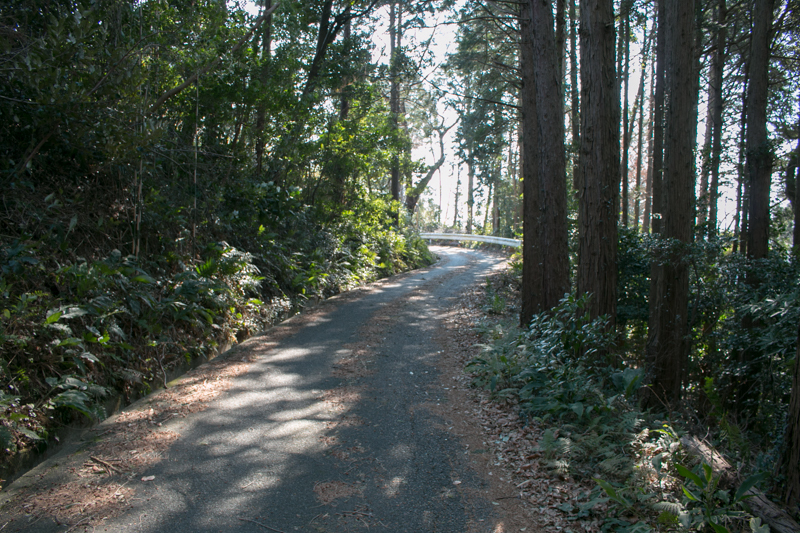 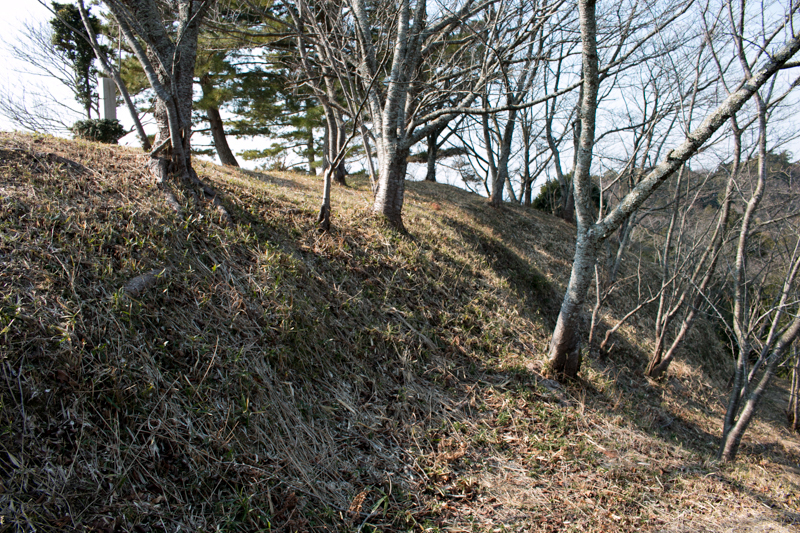 Western edge of Makinohara height had a rolling terrain shaped by Kikugawa river and its tributaries, and flat height surrounded by valleys which also works as a water source was an ideal place as a main base of medieval samurai groups. Generally, Totomi province is not so appealing in the former half of Sengoku era, until the time when Ieyasu Tokugawa (1543-1616), the warlord of Mikawa province (eastern half of Aichi prefecture) captured the province and moved its main base to Hamamatsu castle in 1568. 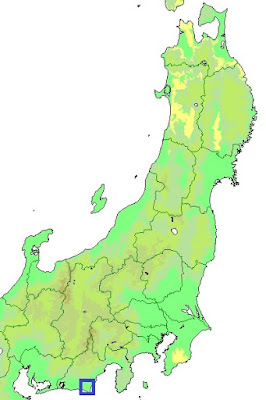 Unlike Suruga province or Mikawa province at both edge which flourished strong warlords, Totomi province did not have their own authority. 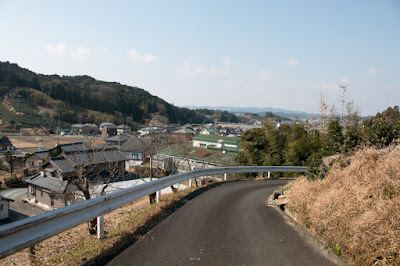 As a province at the middle of Tokaido road, an artery connected Kyoto city and Kamakura city, Kamakura Shogunate and Muromachi Shogunate both thought important of this province then placed their relative as the governor. At the establishment of Muromachi Shogunate, Ashikaga clan appointed Imagawa clan, a close relative of Shogun, as the governor of Suruga province (middle part of Shizuoka prefecture) and Totomi province. In the latter half of 14th century, Sadayo Imagawa (1326-1420, also known as his Buddhist name Ryoshun), a tributary of Imagawa clan and governor of Totomi province, was appointed as a general governor of Kyushu island then made significant achievement at the battle against South Court supporters which reigned Kyushu island and finally captured whole part of island from them. But Muromachi Shogunate feared his power and tried to retrieve the control of Kyushu island and diplomacy with continent dismissed Sadayo. Disappointed Sadayo returned to Totomi province, but further being slandered as participated in the rebel of Yoshihiro Ouchi (1356-1400) and was forced to retire. 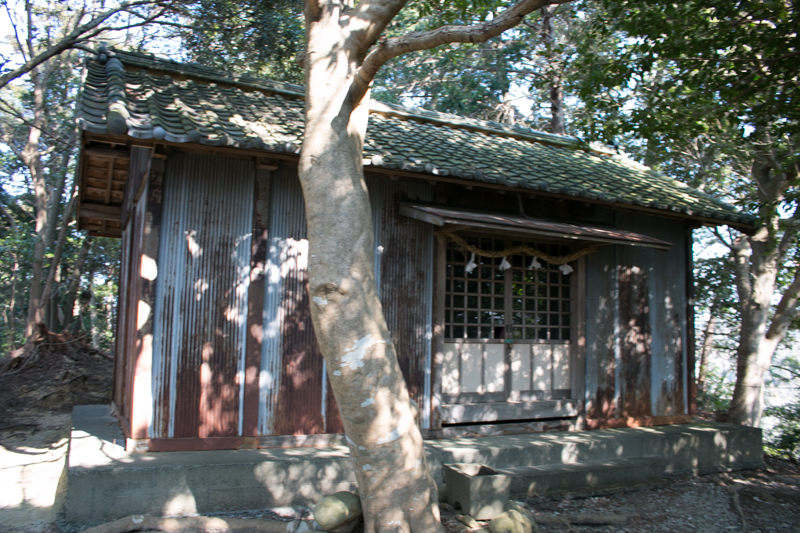 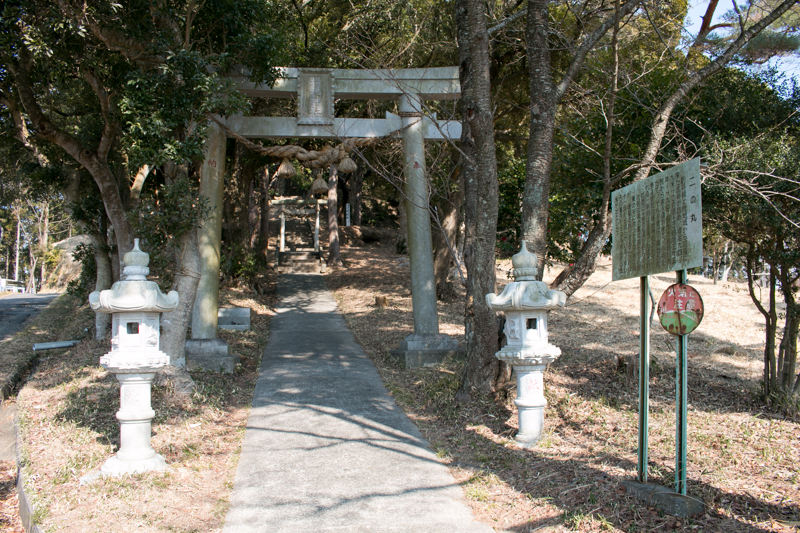 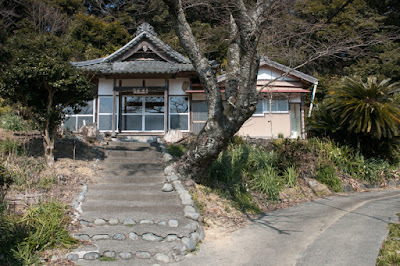 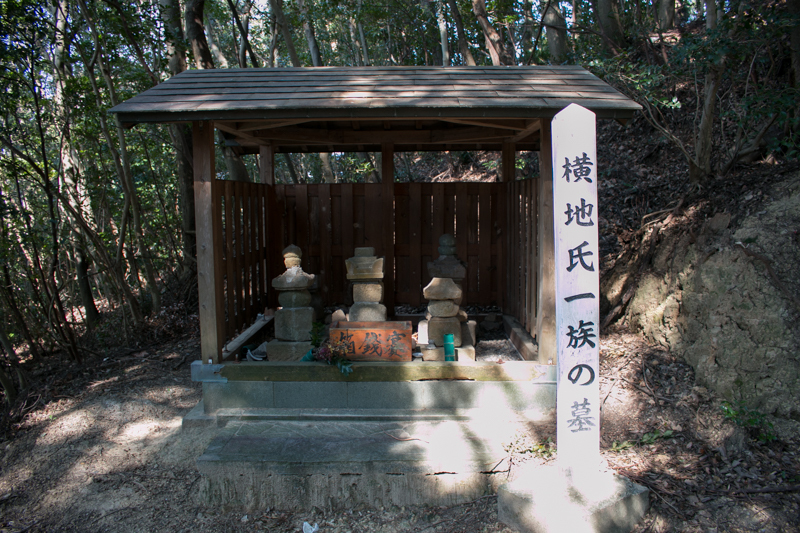 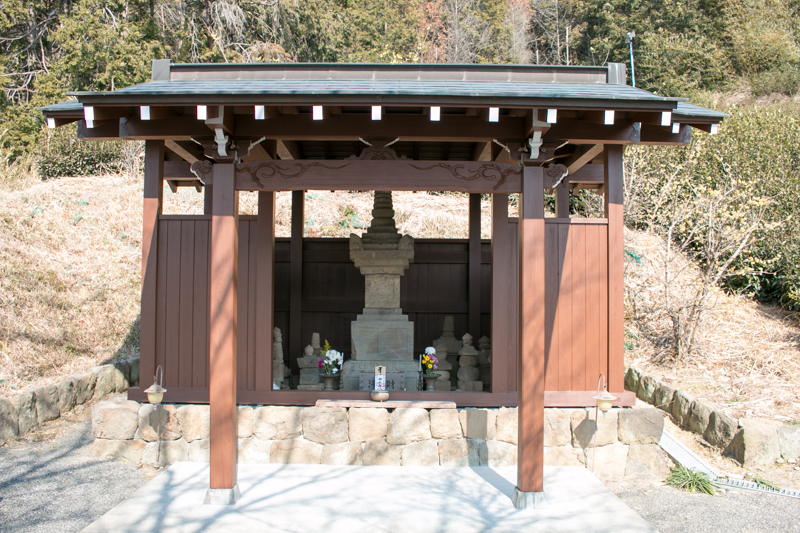 Imagawa clan still prospered at Totomi province for several decades. 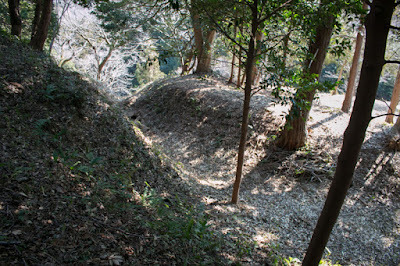 However, in the middle of 15th century, Totomi province was given to Shiba clan which was a high class retainer of Muromachi Shogunate along with Echizen province (Fukui prefecture) and Owari province (western part of Aichi prefecture). 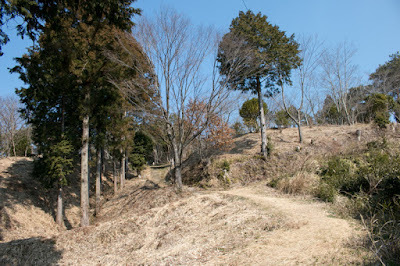 Imagawa clan at Totomi province fell into the retainer of Shiba clan and named as Horikoshi clan. 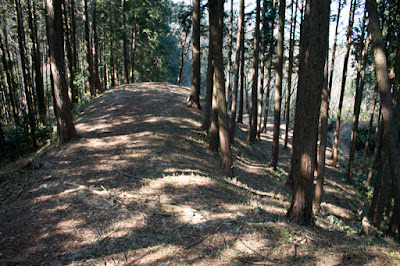 Shiba clan was a powerful lord which held the governor of important province at the entrance into Kinki region from eastward. 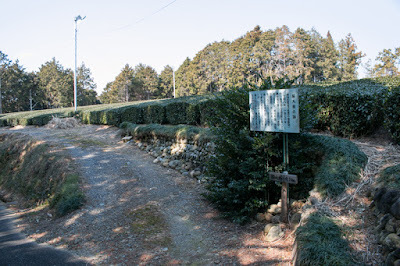 But these territories were apart each other and separated from Kyoto city, Shiba clan placed deputy governors at these territories, such as Asakura clan at Echizen province or Oda clan at Owari province. Around the battle of Onin occurred from 1467 to 1478, Shiba clan declined because of continuous internal conflict and involvement in the battle. 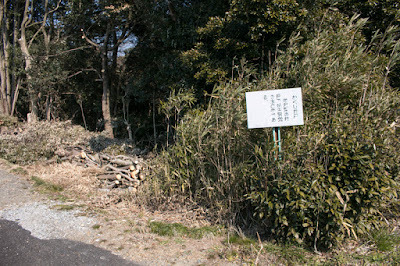 At Echizen province and Oda province, deputy governors gradually grew their power and tried to overthrow the governance of Shiba clan. 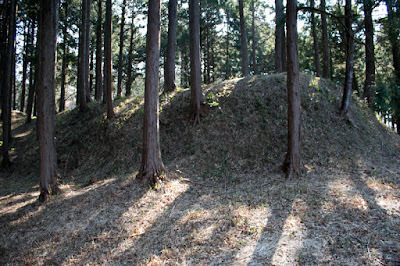 On the other hand, at Totomi province, Horikoshi clan also tried to expel Shiba clan from province but was defeated by local lords such as Yokoji clan or Katsumata clan supported Shiba clan. 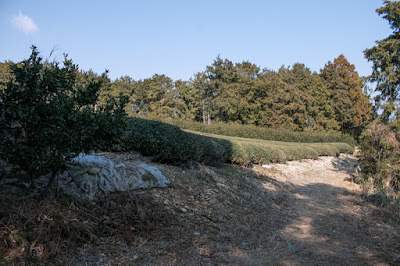 Looking at this failure, the main family of Imagawa clan grew as the governor of Suruga province tried to retrieve their former territory and intervened into Totomi province. 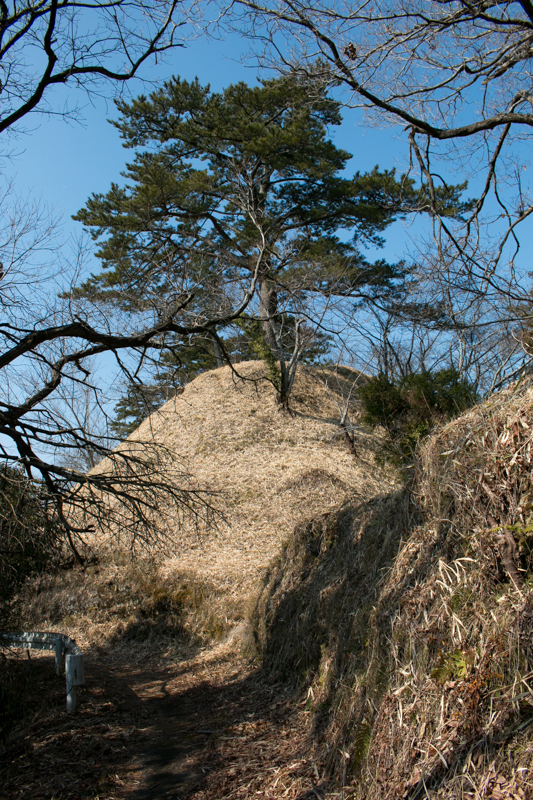 Yokoji castle was built by local lord Yokoji clan in 14th century. 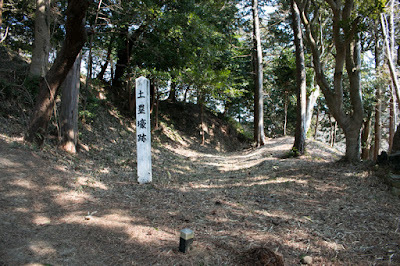 Yokoji clan. It is said that Ietada Yokoji (?-? 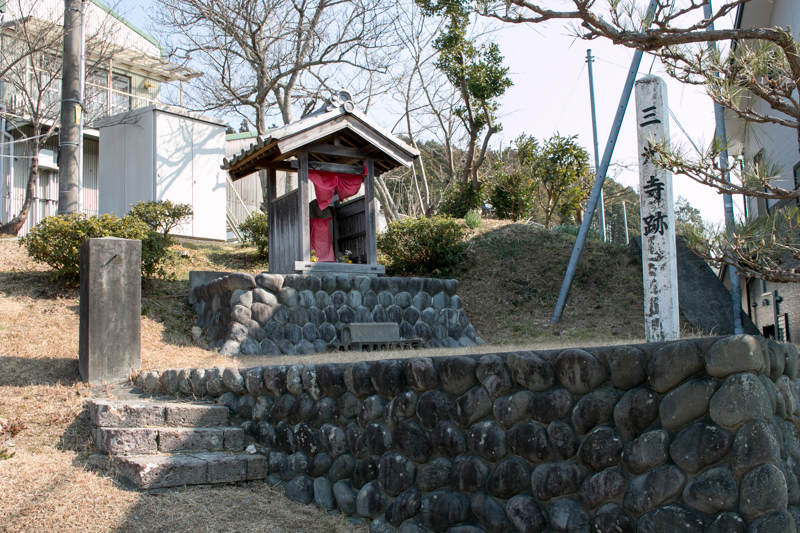 ), the founder of Yokoji clan, was a son of Yoshiie Minamoto (1039-1106) who was the leader of Minamoto clan and activated at Gosannen no Eki in Tohoku region then later was regarded as a symbol of Japanese Samurais. 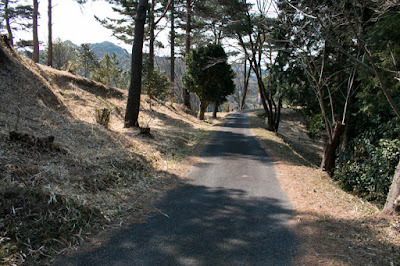 When Yoshiie marched to Tohoku region from Kyoto city he posted at residence of local lord Sagara clan, then Ietada was born between Yoshiie and daughter of this local lord. Ietada was an eldest son of Yoshie but was not a legitimate son, thus Yoshiie gave a manor at Yokoji area and appointed as the lord. 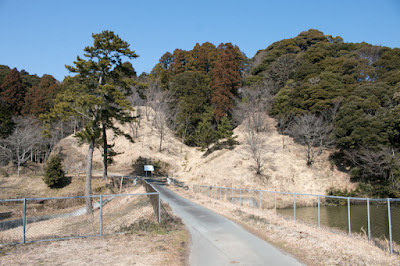 At the rise of Yoritomo Minamoto (1147-1199), the descendant of Yoshiie and founder of Kamakura Shogunate, Yokoji clan served to Yoritomo and was deeply trusted. After the fall of Kamakura Shogunate in 1333, Yokoji clan and their branch family Katsumada clan followed to Takauji Ashikaga (1305-1358) and fought with opponent North Court supporters such as Ii clan at Totomi province. 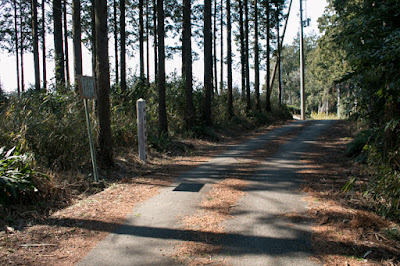 Yokoji area was on the way of Akiba Kaido road which started from Sagara area at Enshu bay toward Iida area of Shinano province (Nagano prefecture) through Kakegawa area and Futamata area. 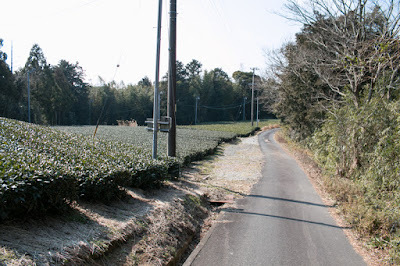 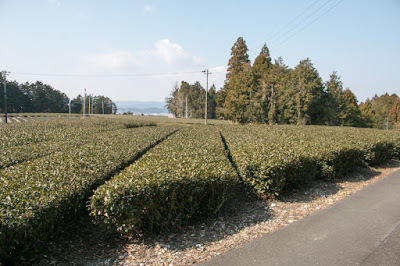 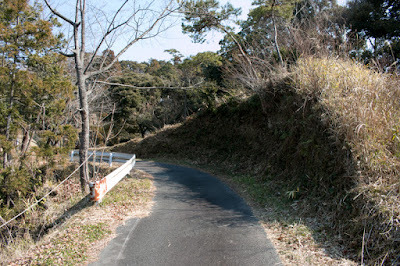 As Akiba Kaido road was used to transport salts made at Sagara area to mountainous Shinano province, Yokoji clan was a wealthy clan from trade of salt and exercised its influence to whole part of Totomi province. 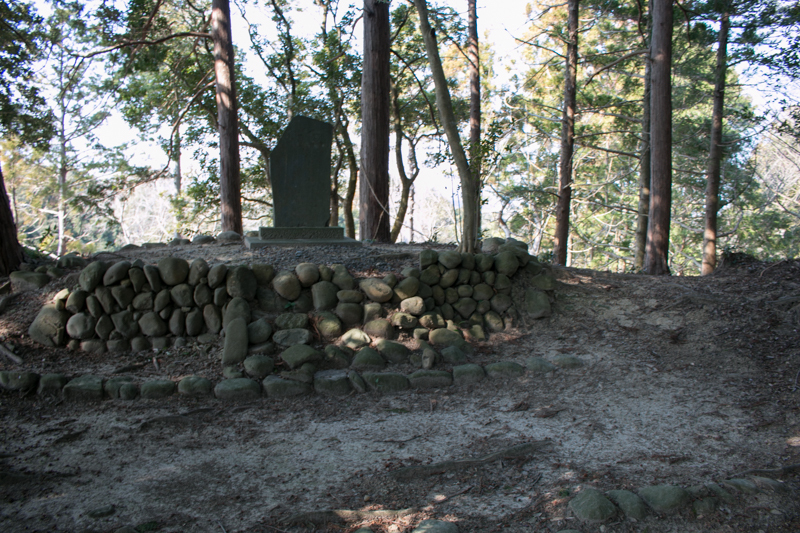 Yokoji clan directly served to Muromachi Shogunate because of its origin and achievement, and fixed its position as a major local lord in the eastern part of Totomi province. Around this time, Yokoji clan newly built Yokoji castle on the height and moved its residence from hillside. Yokoji castle spreads over a peninsular like height sandwiched by Ushibuchi-gawa river and Oku Yokoji-gawa river, being connected to the main body of Makinohara height by narrow bottleneck. 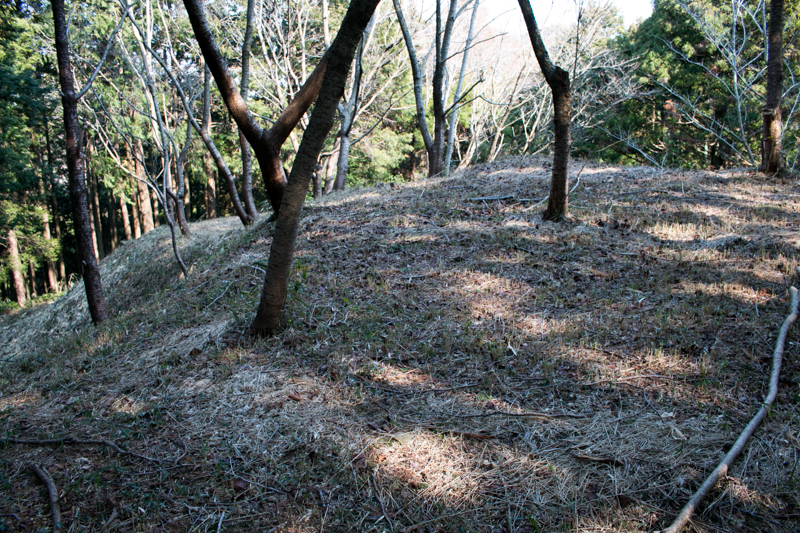 The eastern half of height is castle area, roughly divided into east fort, middle fort and west fort. 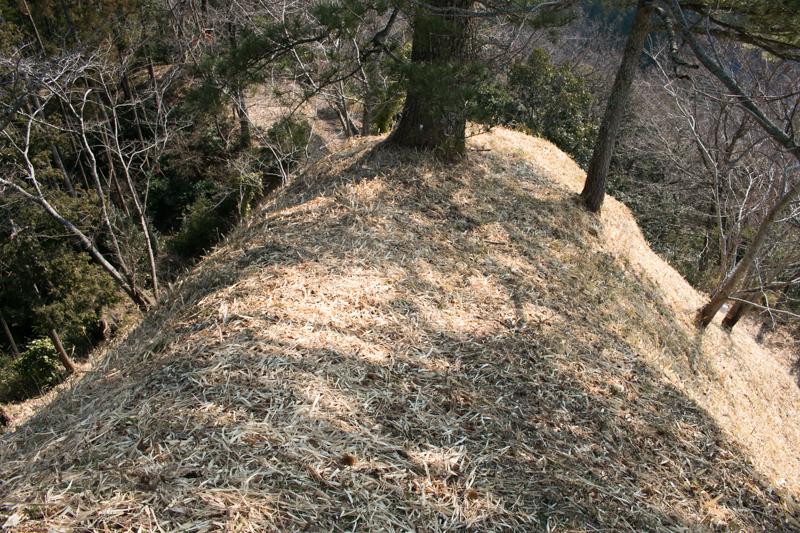 The height itself is a natural castle protected by cliffs and valleys, but terraces were built here and there, and each ridge is separated by dry moats. 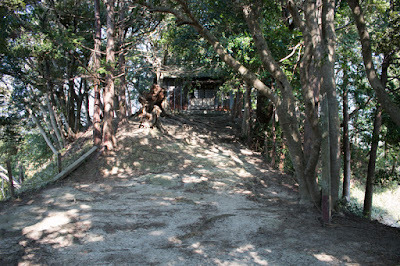 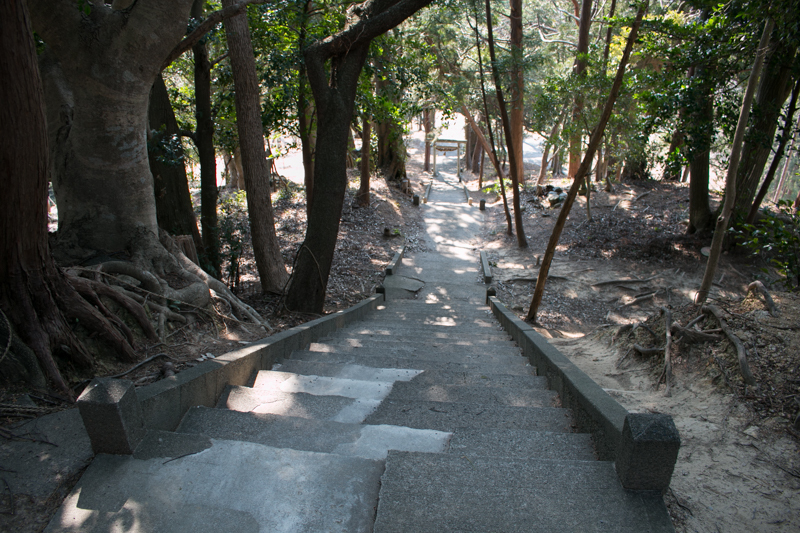 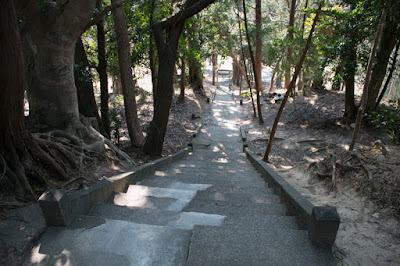 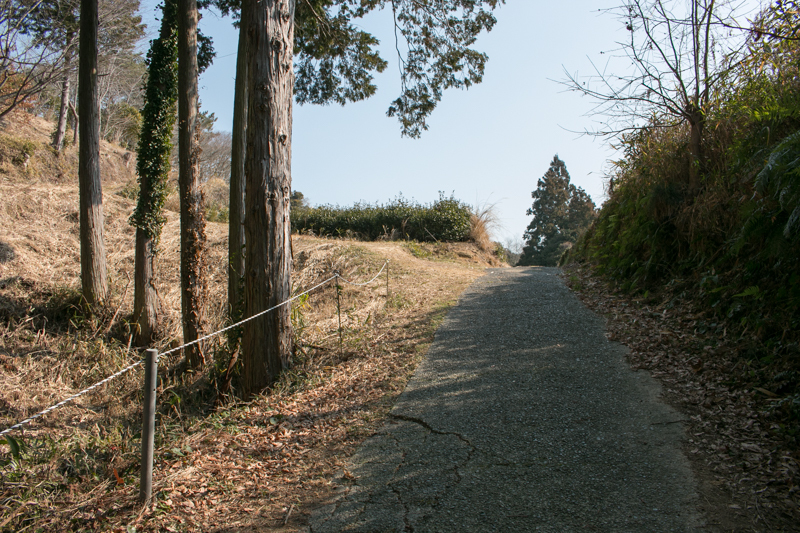 The west fort which is currently used as a ground of Yokoji shrine is an oblong shaped terrace of 40 meter long and 20 meter wide, which might be the original main area. 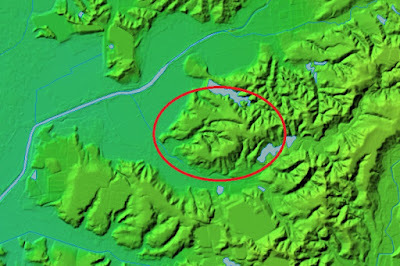 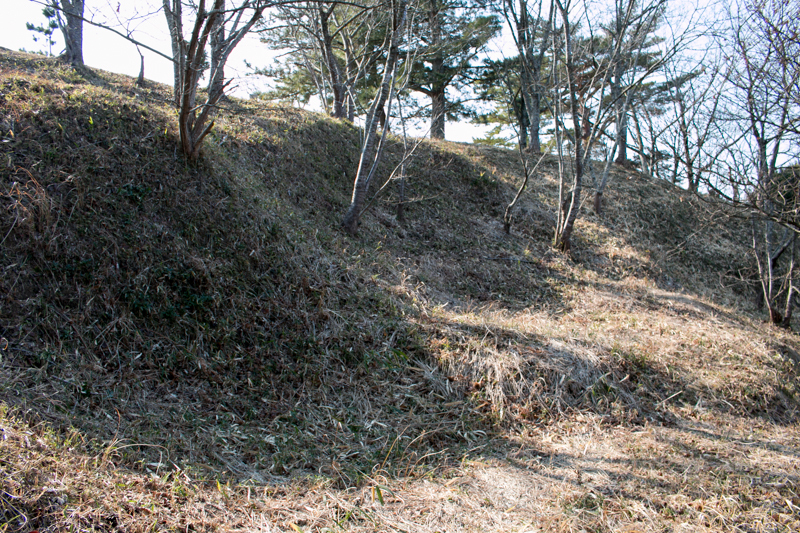 Its south slope and west slope is separated from the main body of the height by dry moats, and several small terraces were built at the ridges spread toward north. 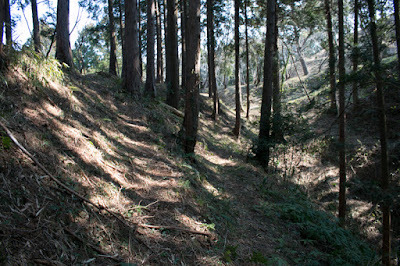 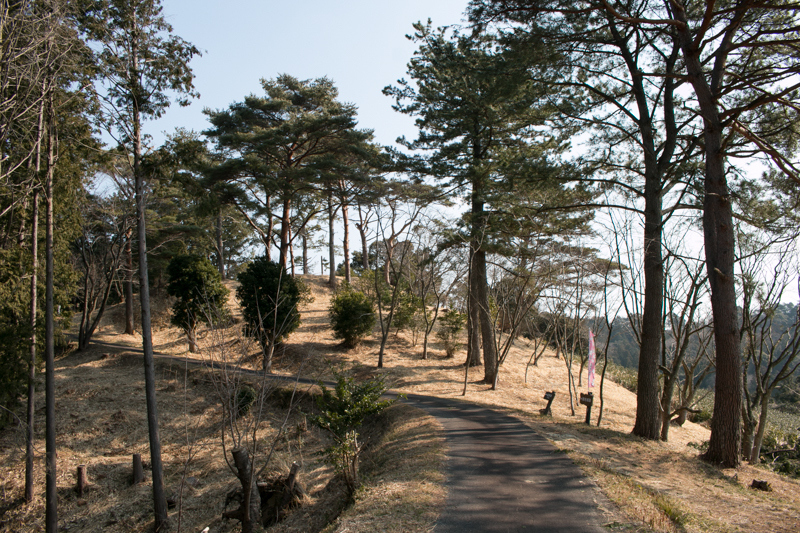 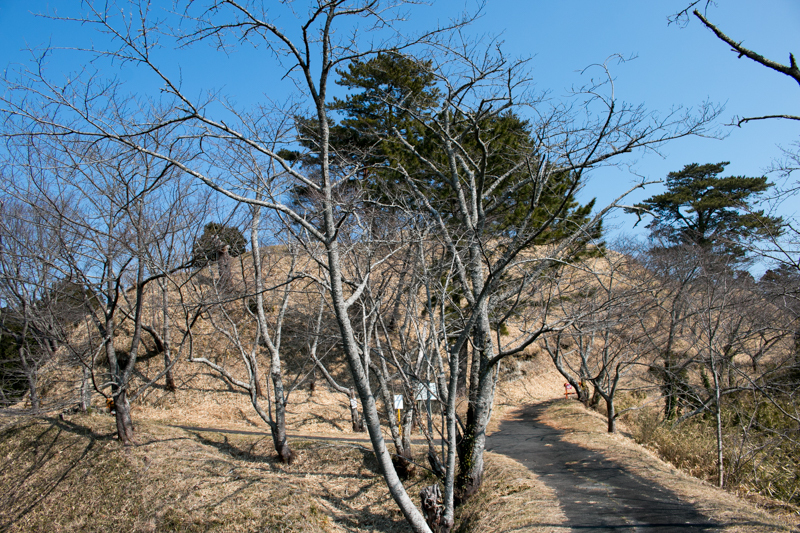 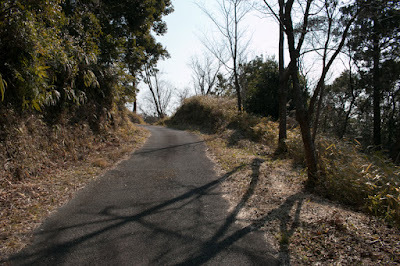 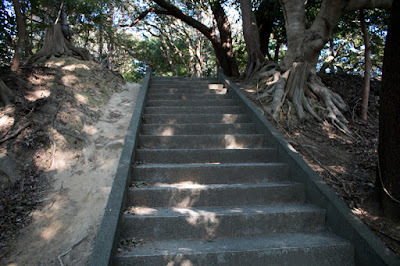 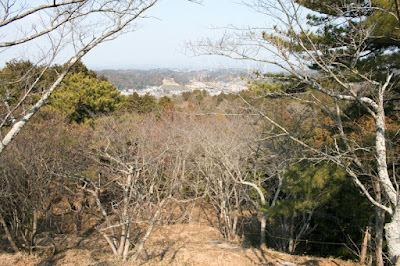 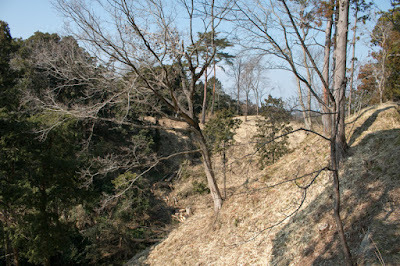 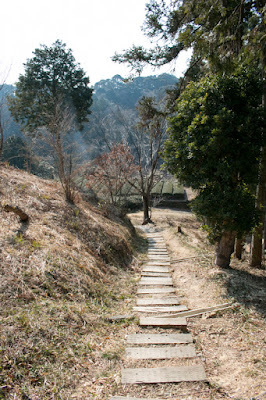 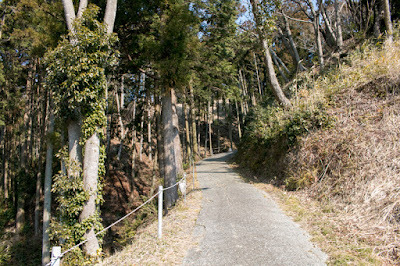 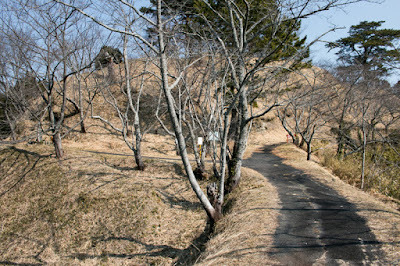 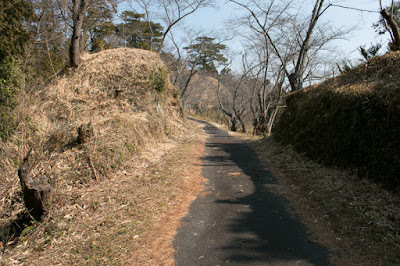 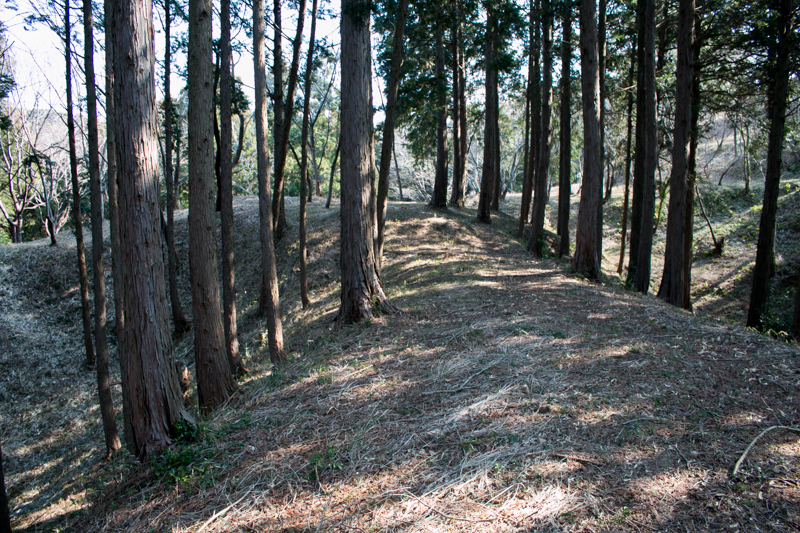 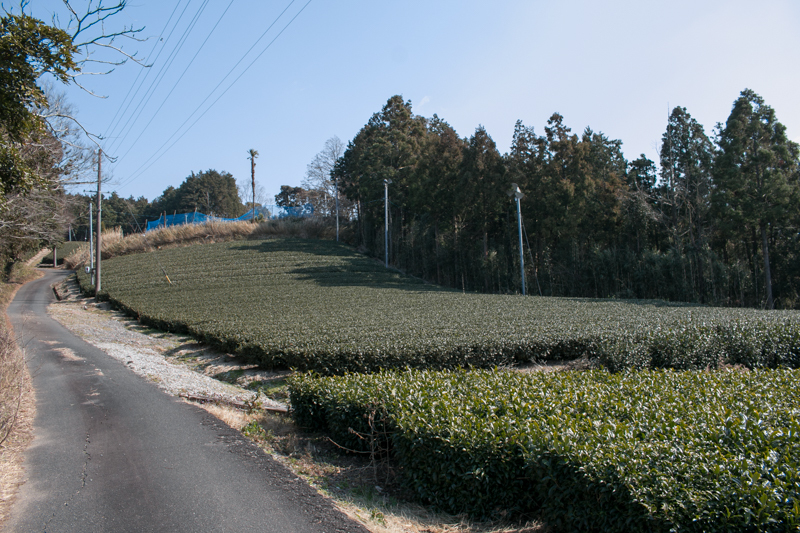 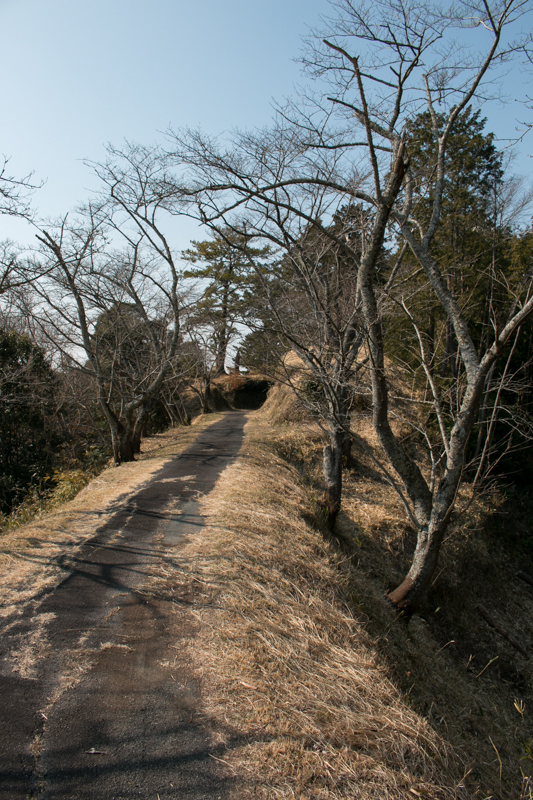 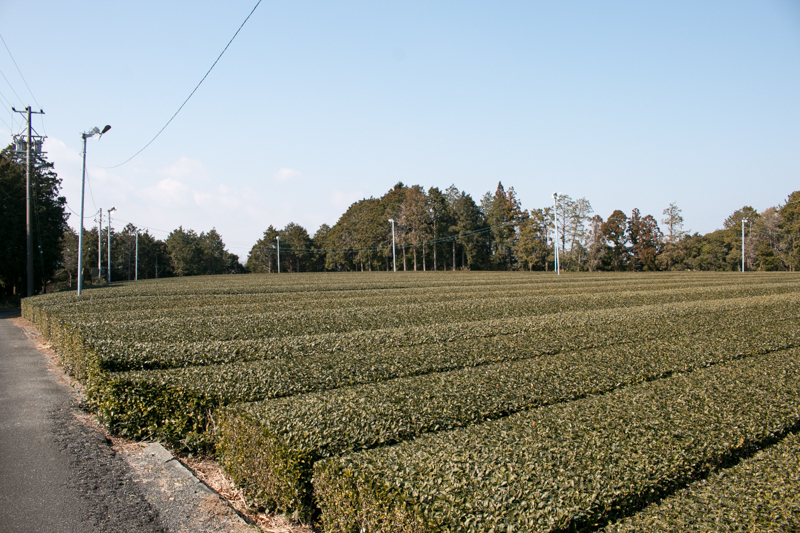 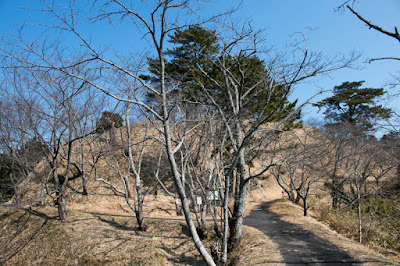 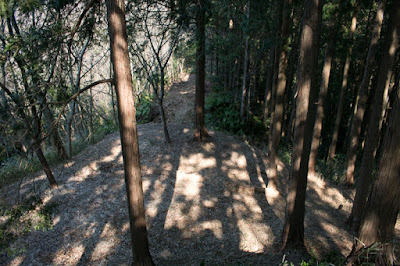 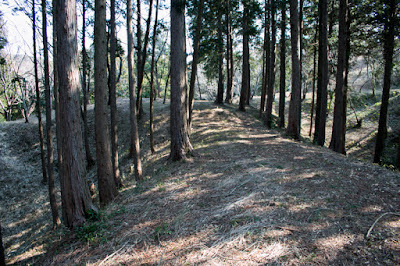 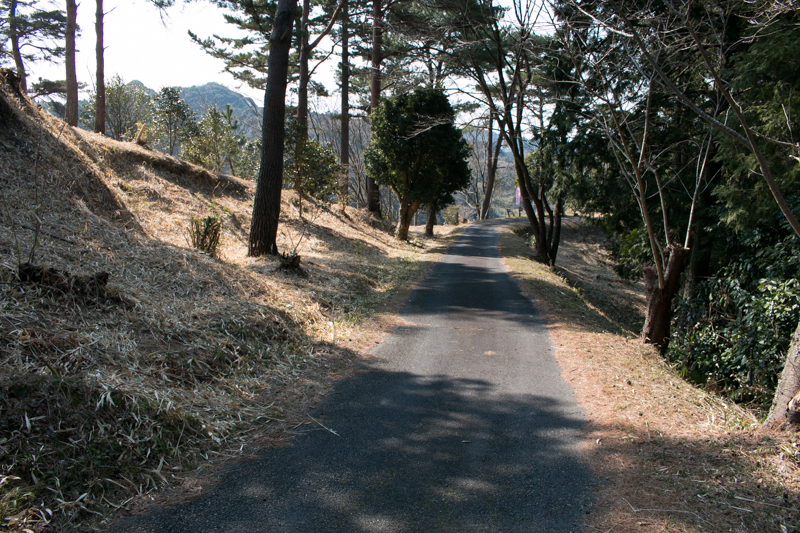 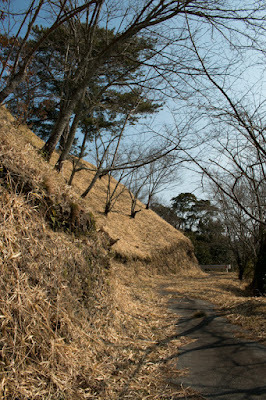 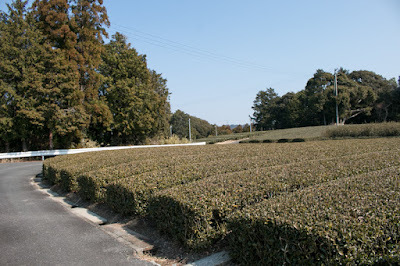 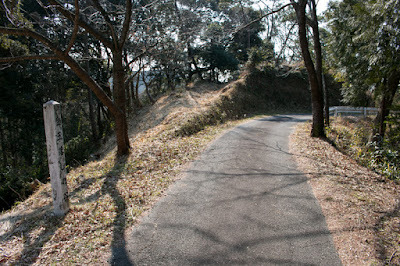 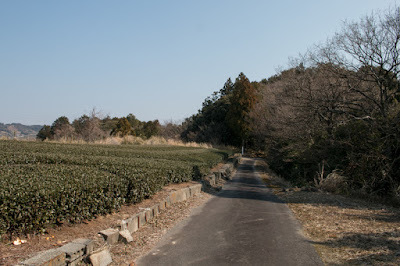 At the south of west fort, there is a large flat terrace of 100 meter long and 40 meter wide named as Senjo-jiki. 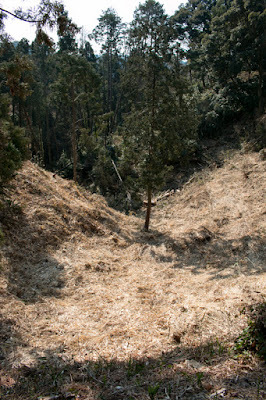 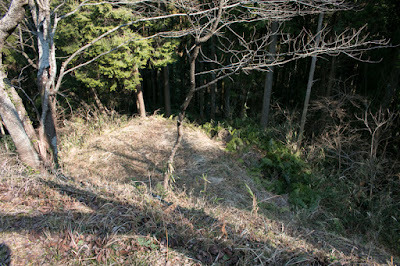 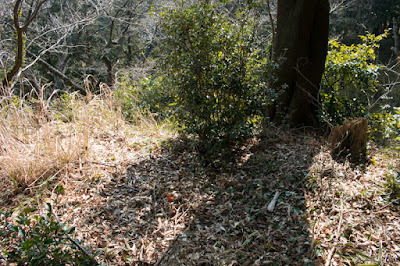 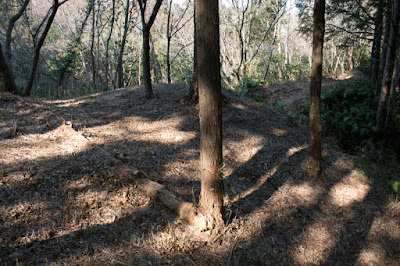 This place might be used as a meeting point or camping point of soldiers at the battle, along with supplies. 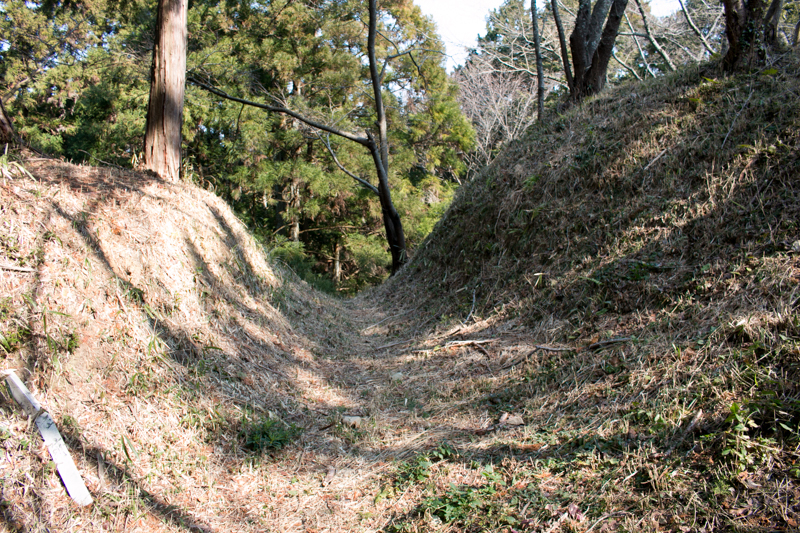 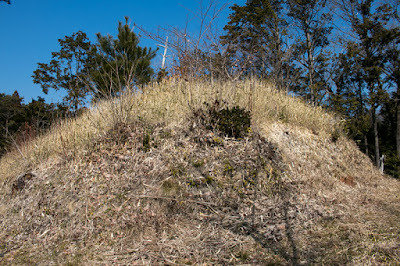 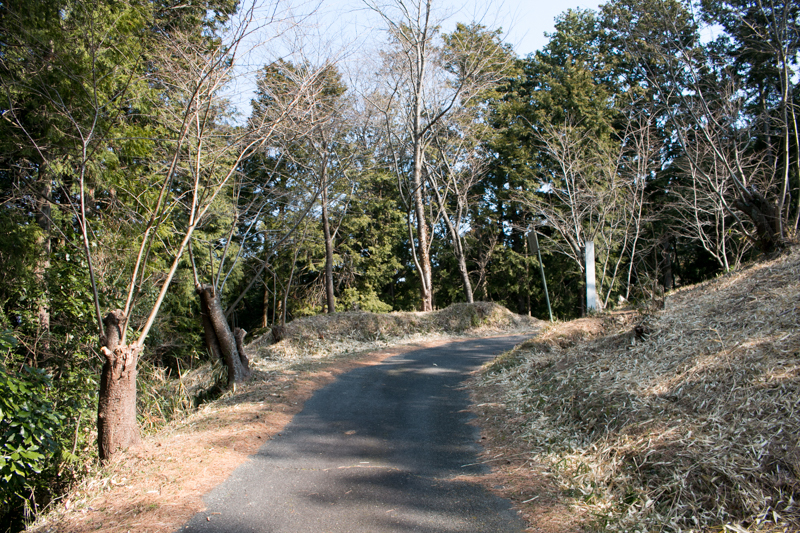 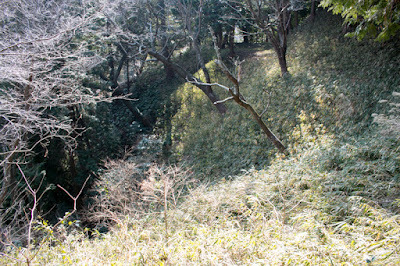 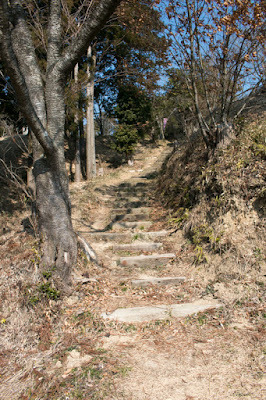 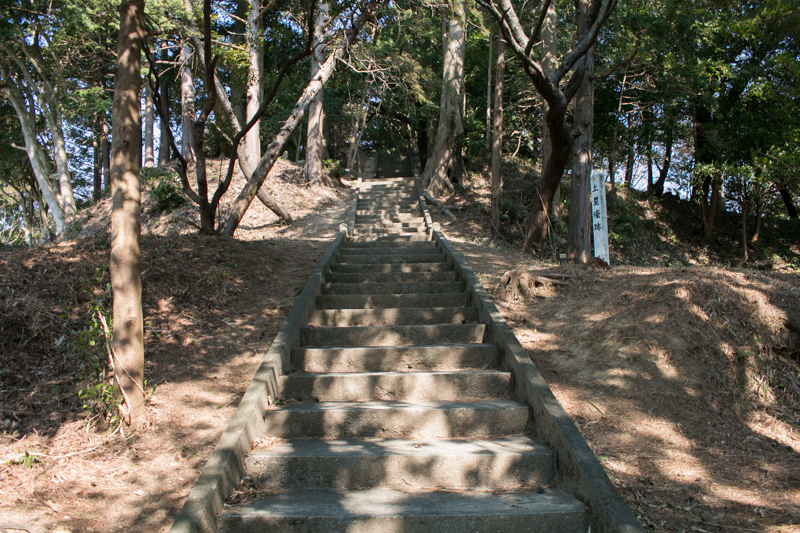 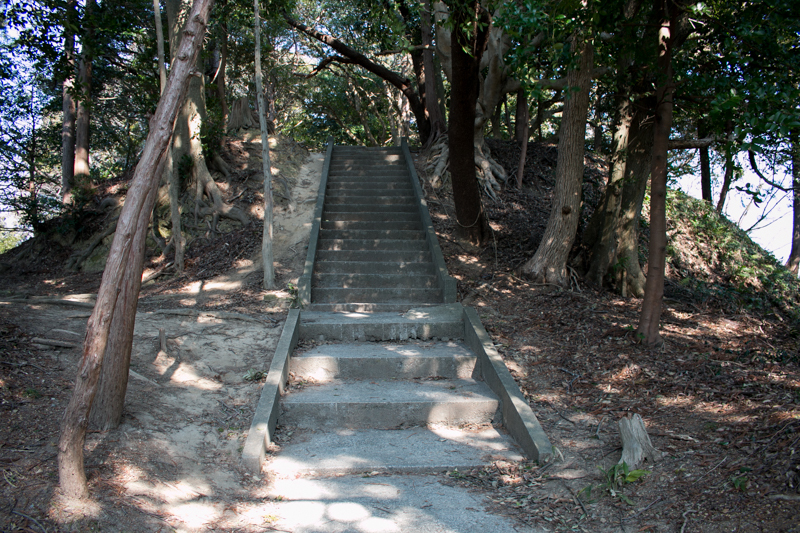 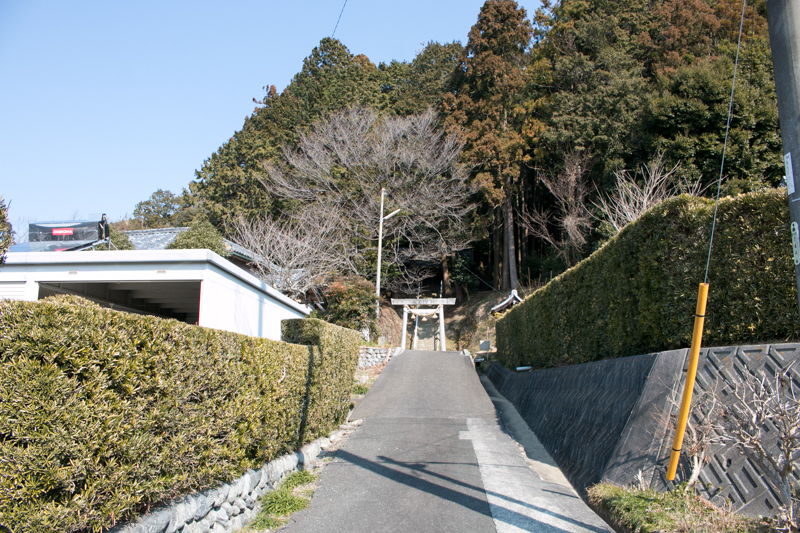 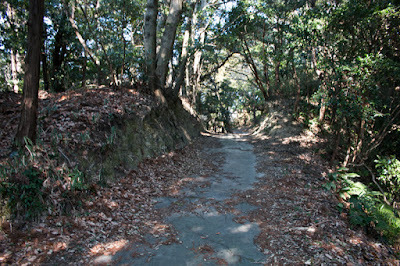 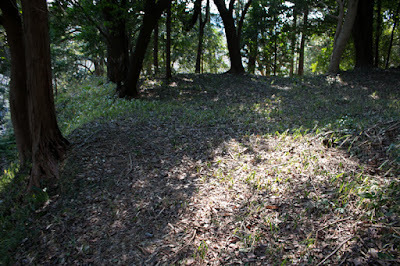 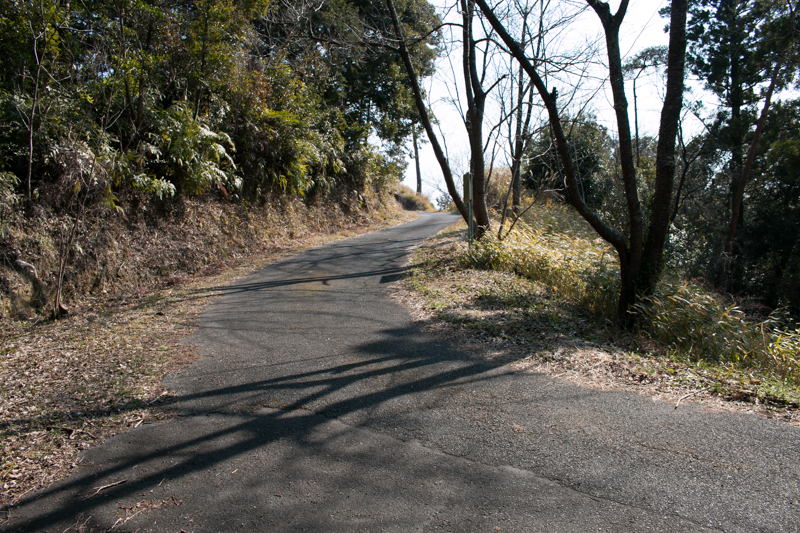 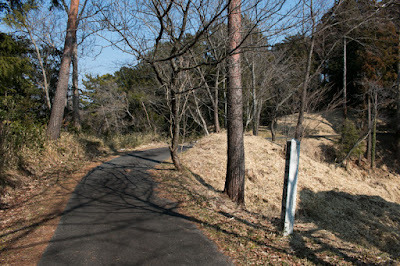 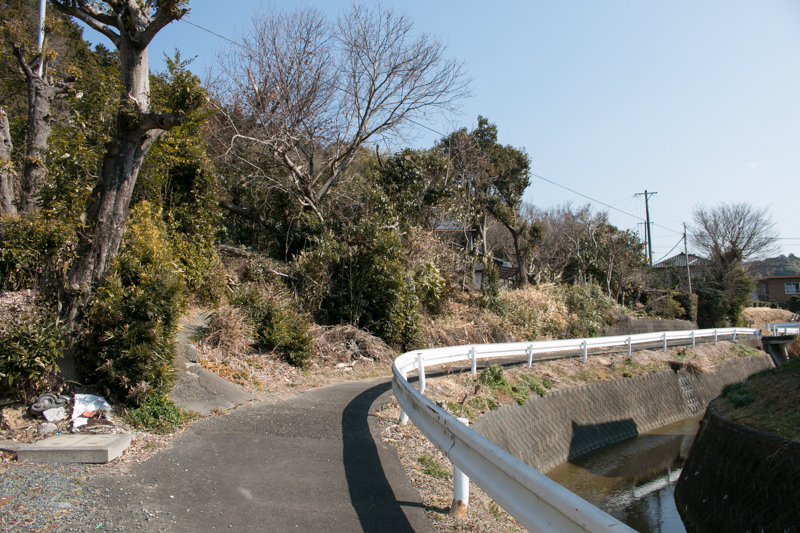 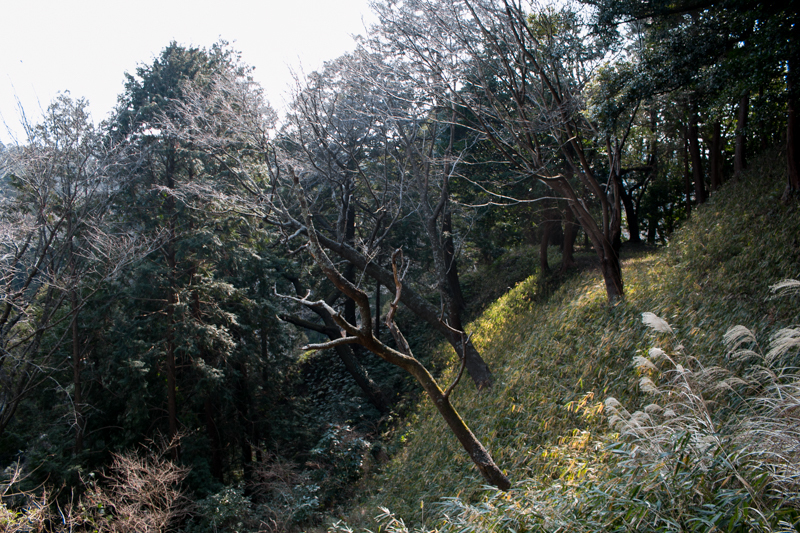 At the east of Senjo-jiki area, there is middle fort named Nakano-shiro worked as a guard place to eastern fort. 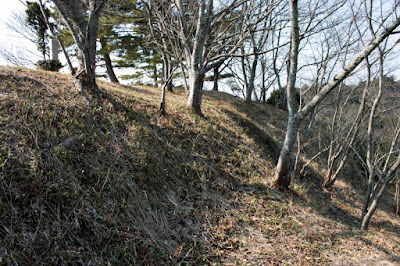 The eastern fort might be the main area of the castle at last period. 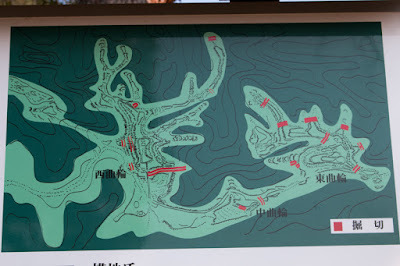 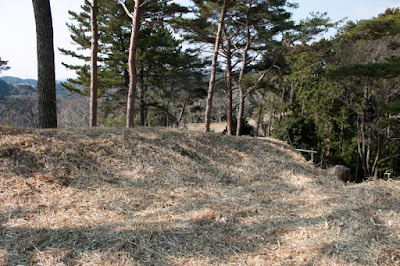 Several terraces were built at small peak and the ridge spreads toward northwest. 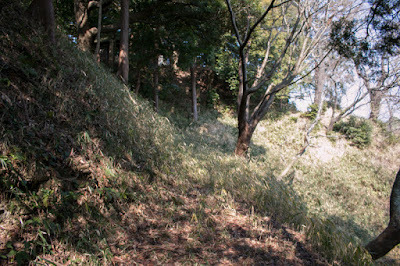 Each terrace is larger than western fort, and there are also clear ruin of dry moat built for northward. 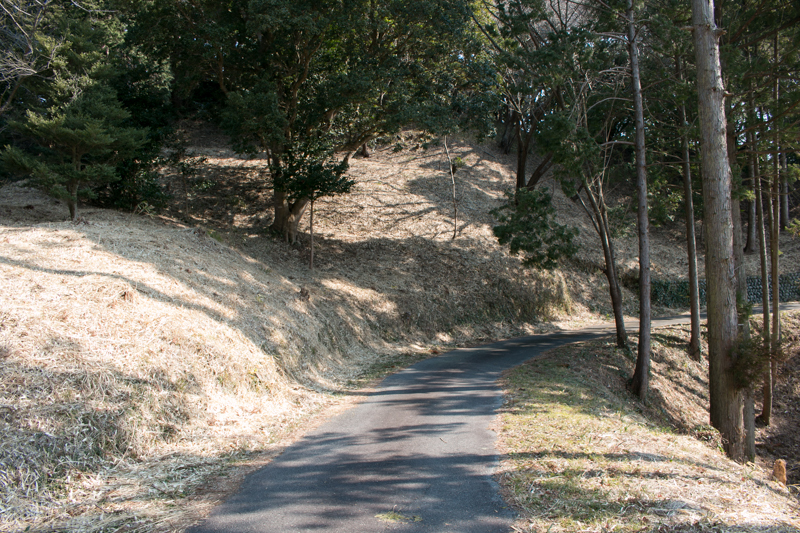 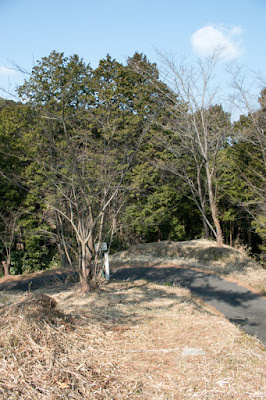 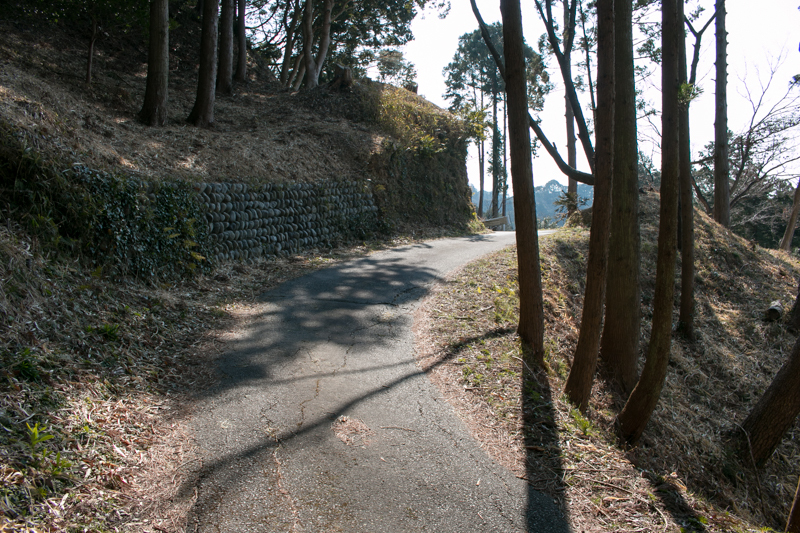 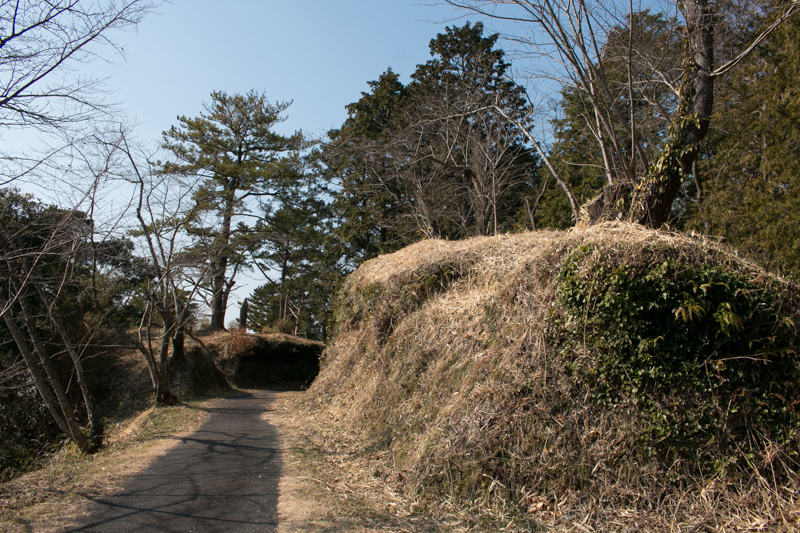 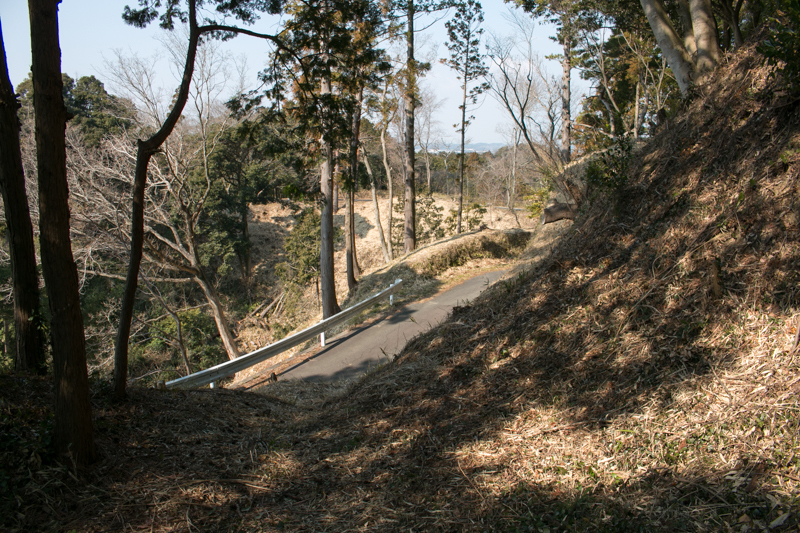 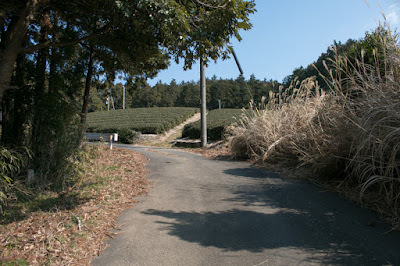 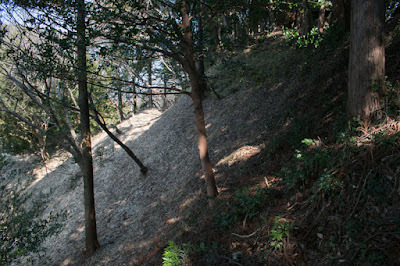 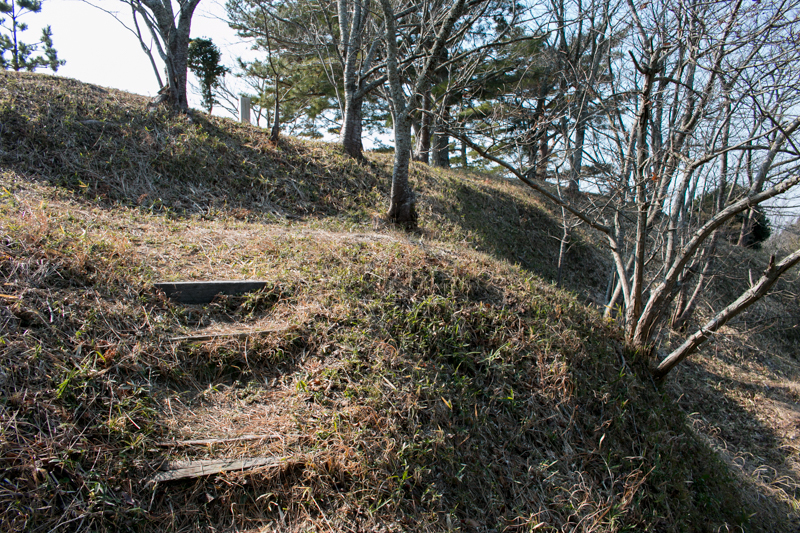 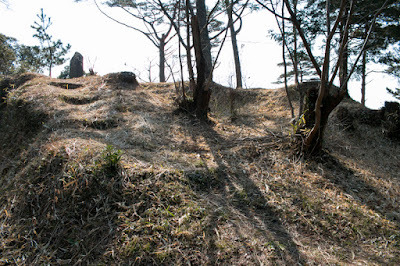 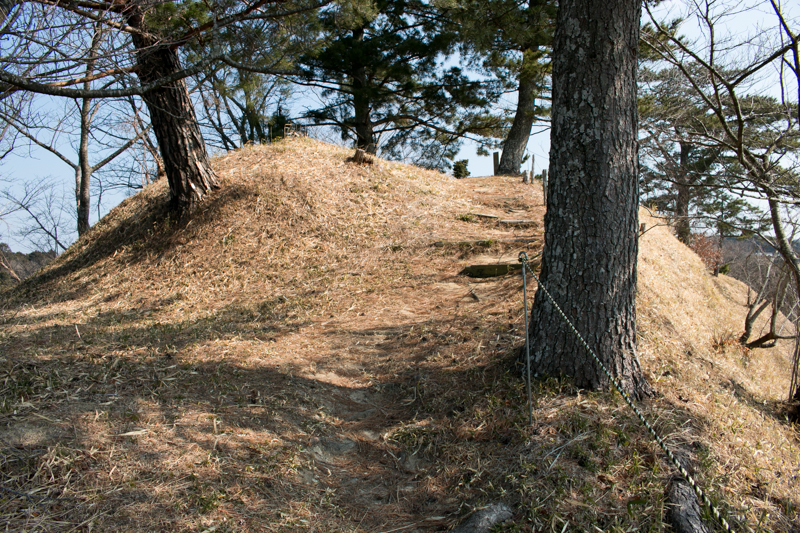 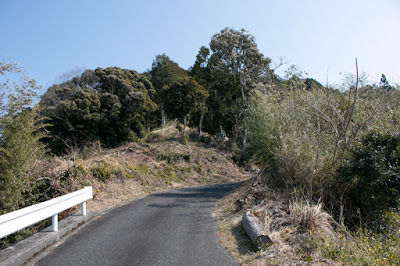 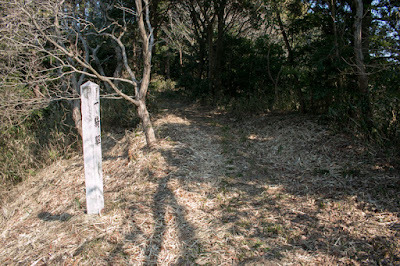 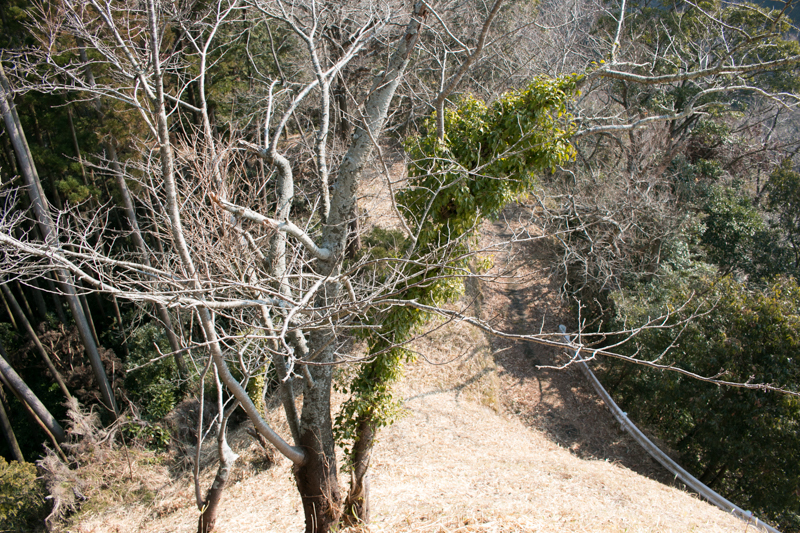 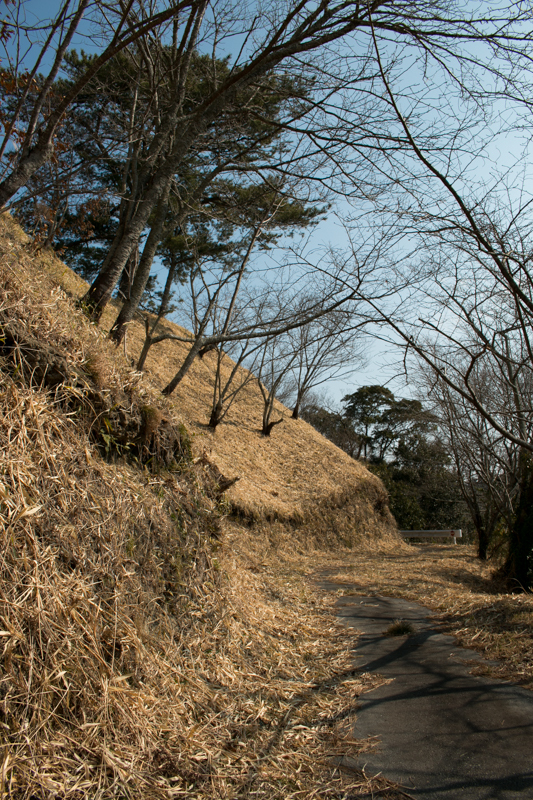 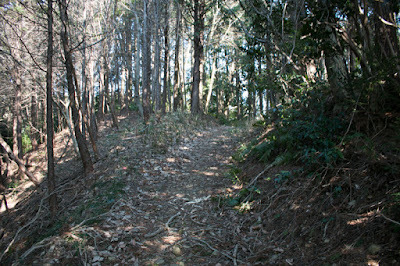 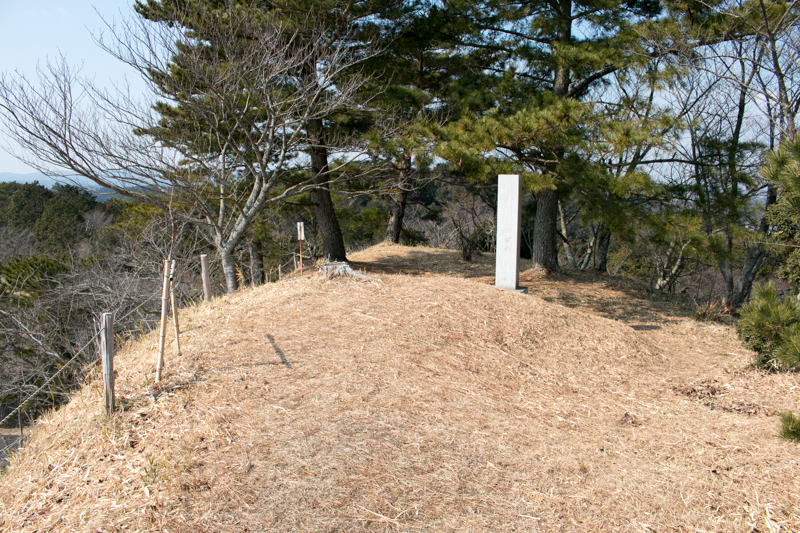 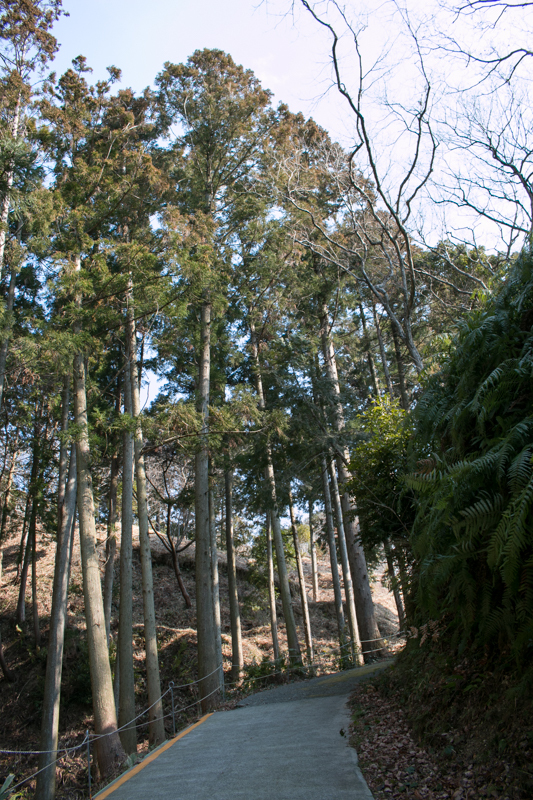 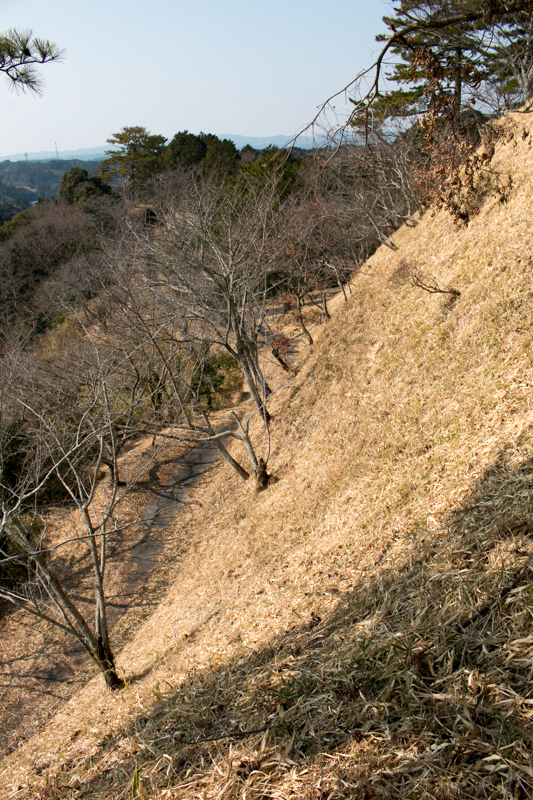 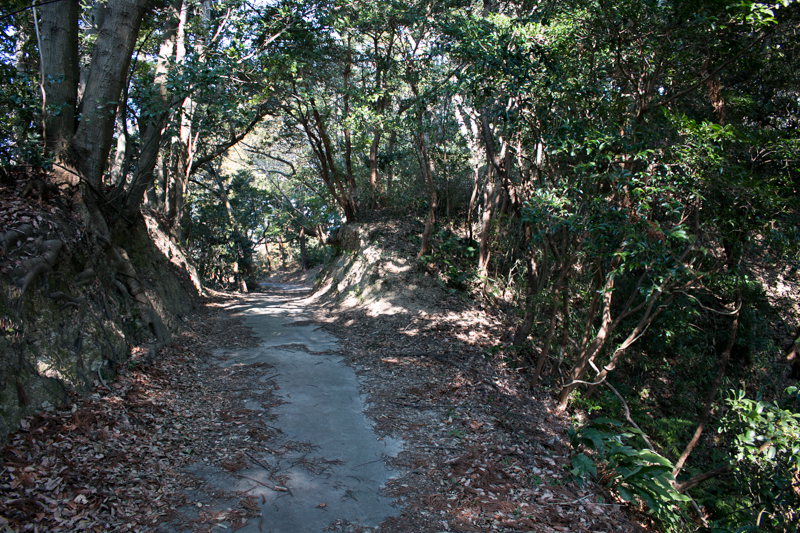 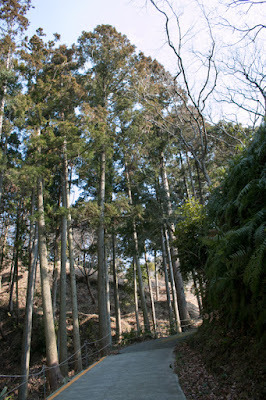 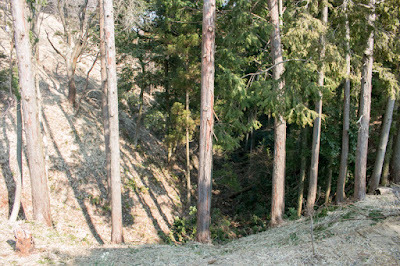 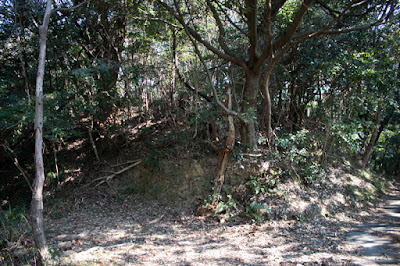 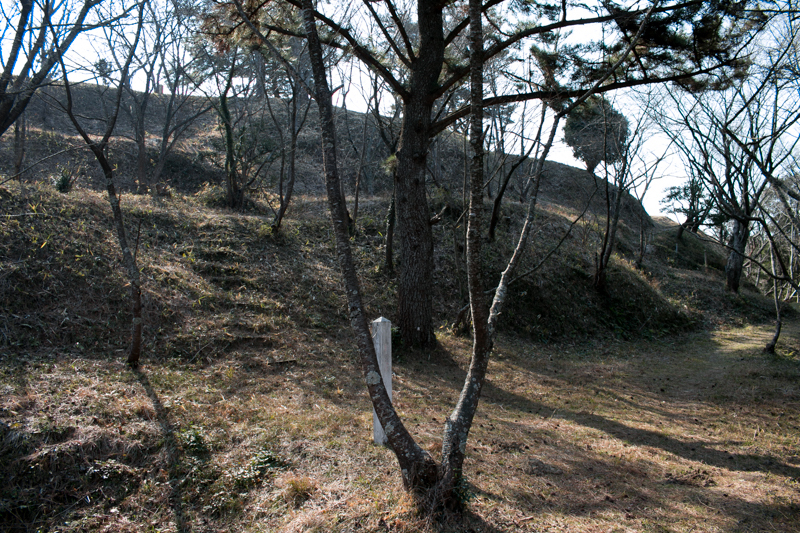 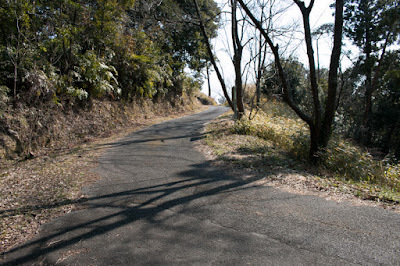 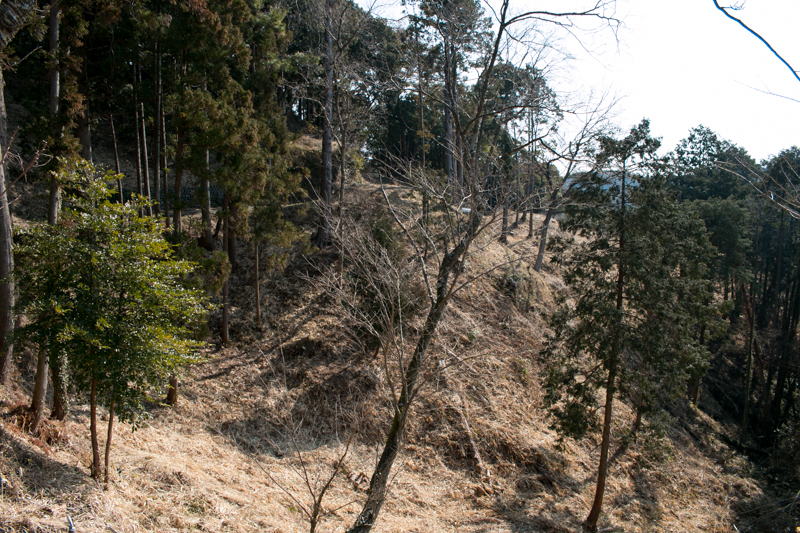 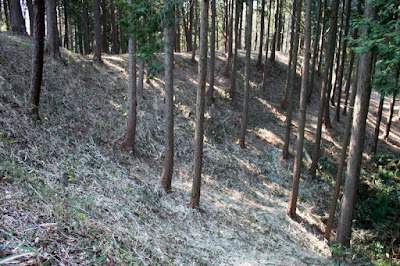 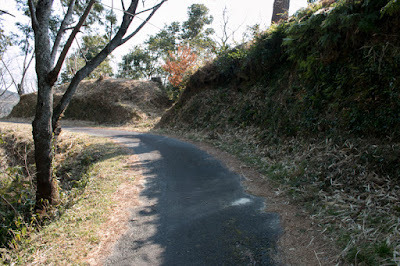 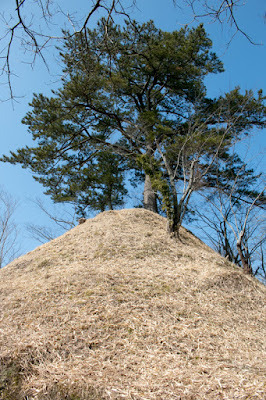 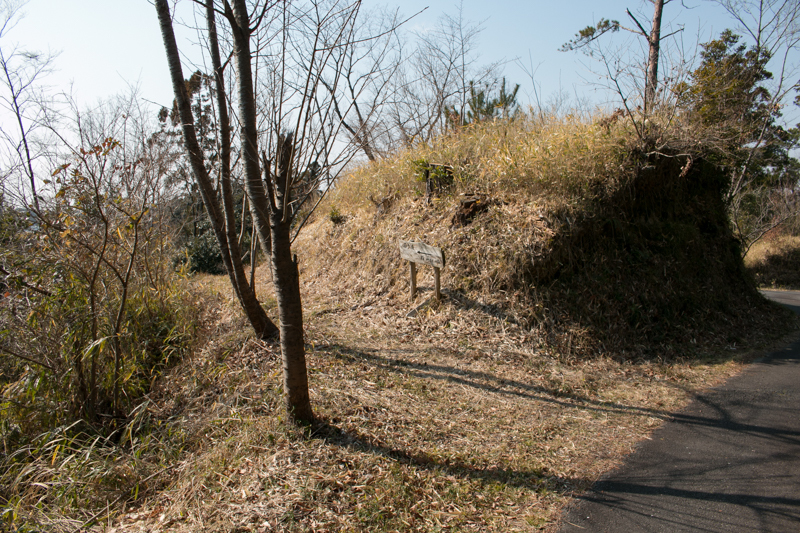 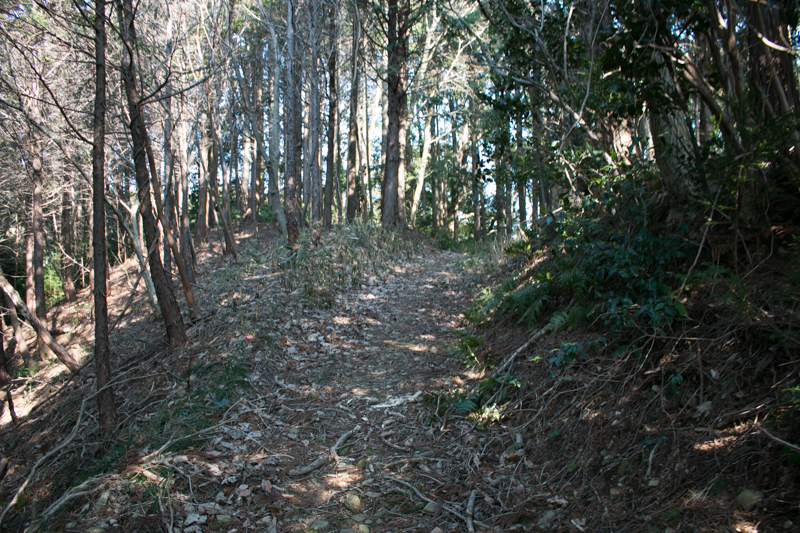 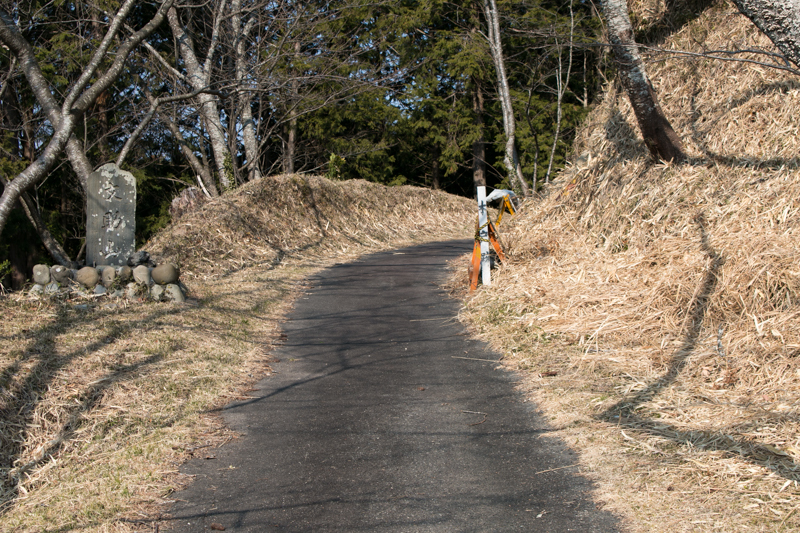 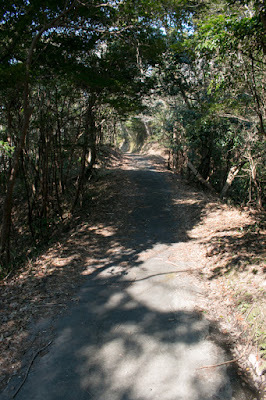 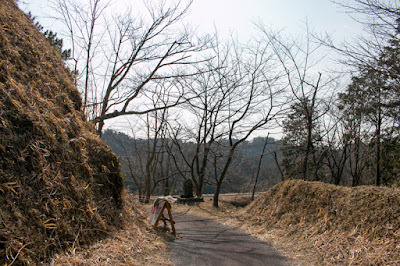 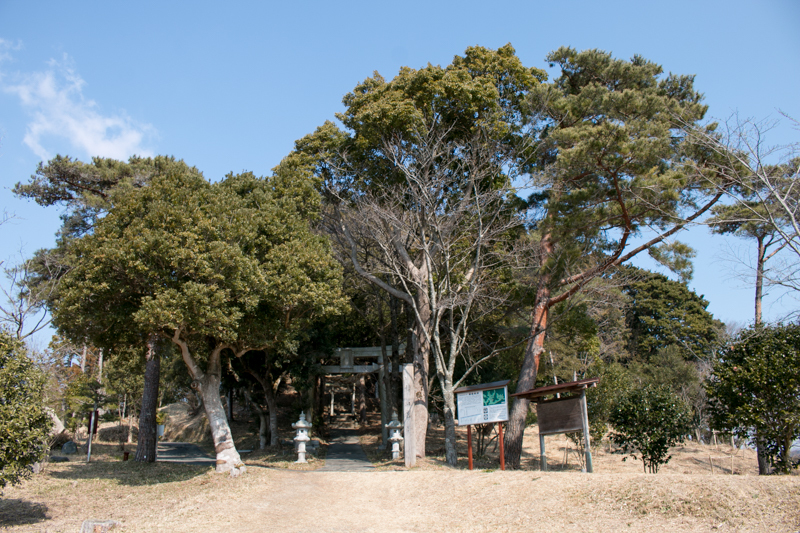 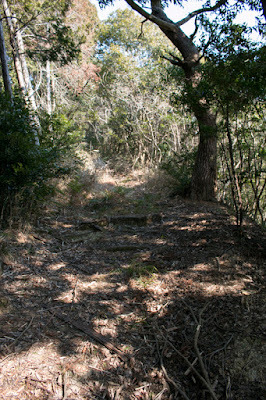 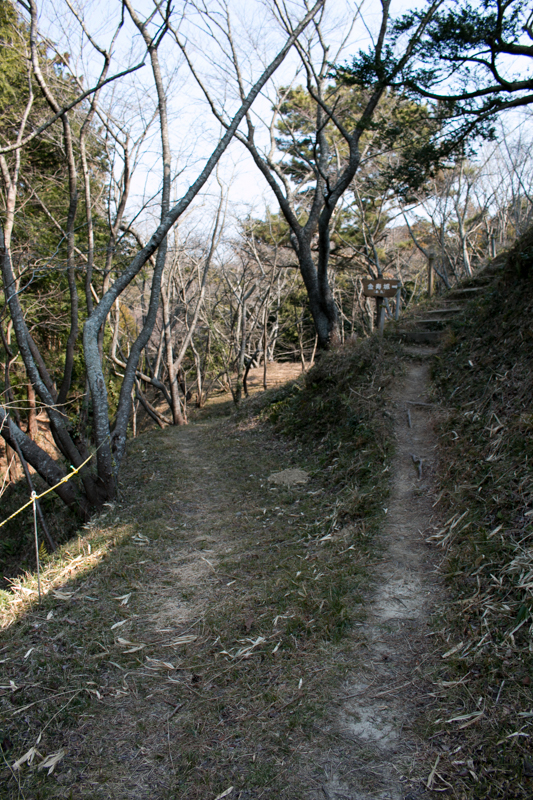 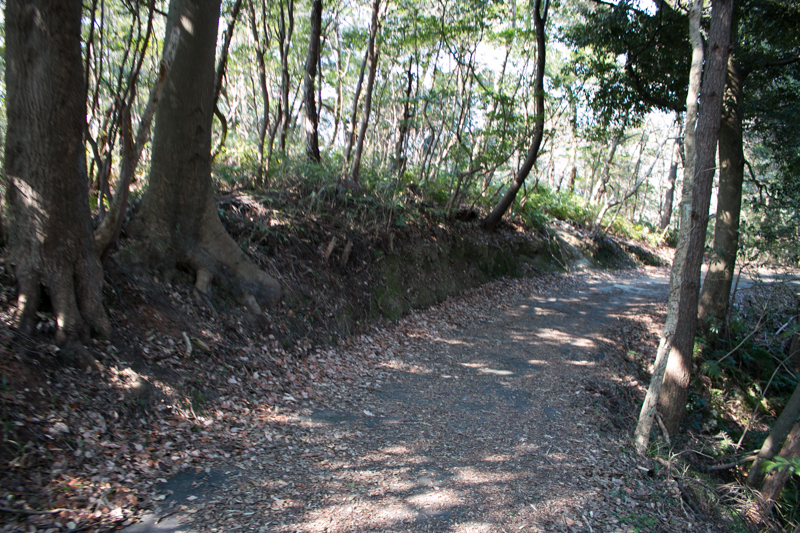 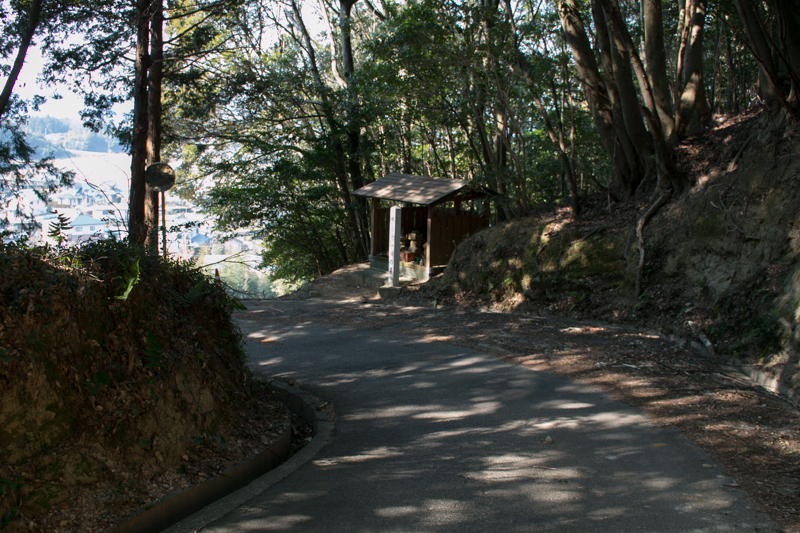 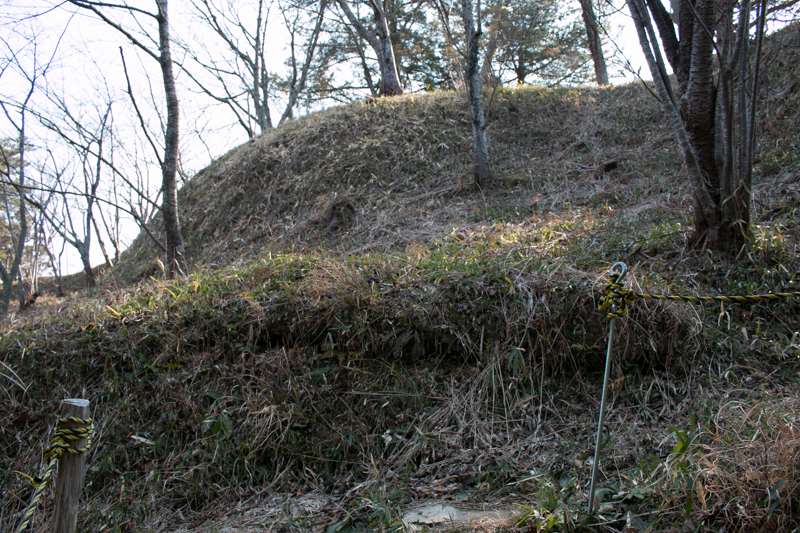 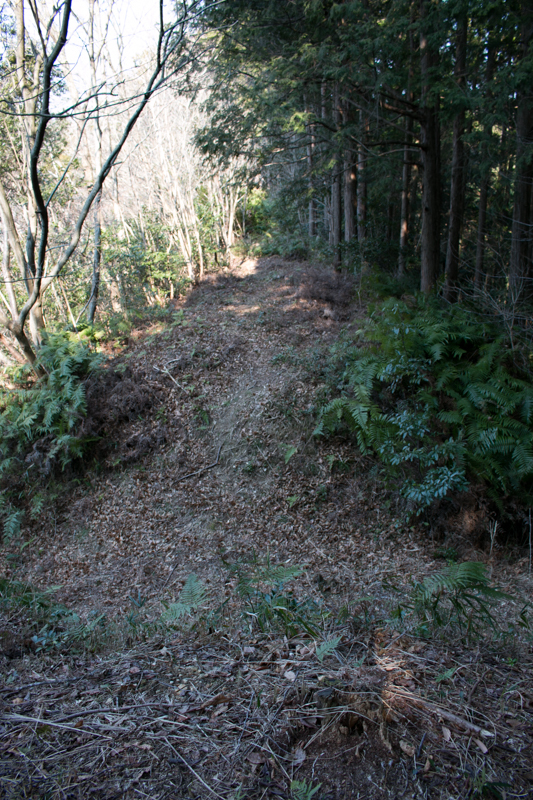 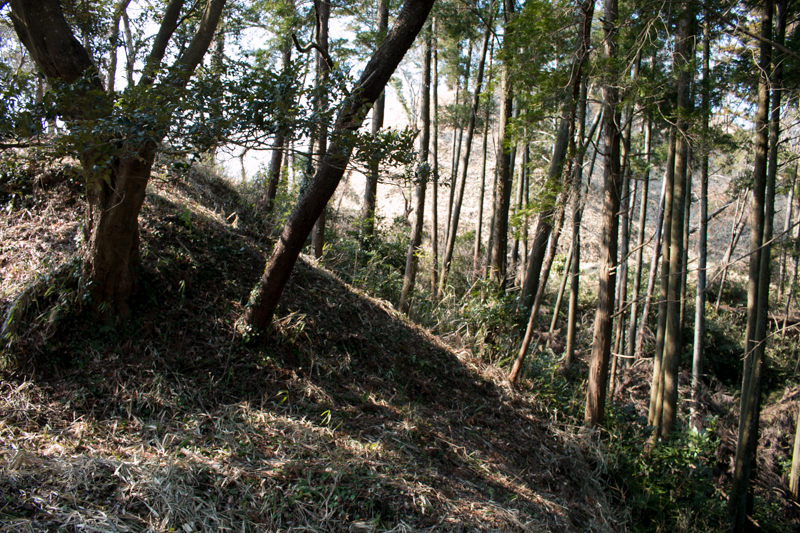 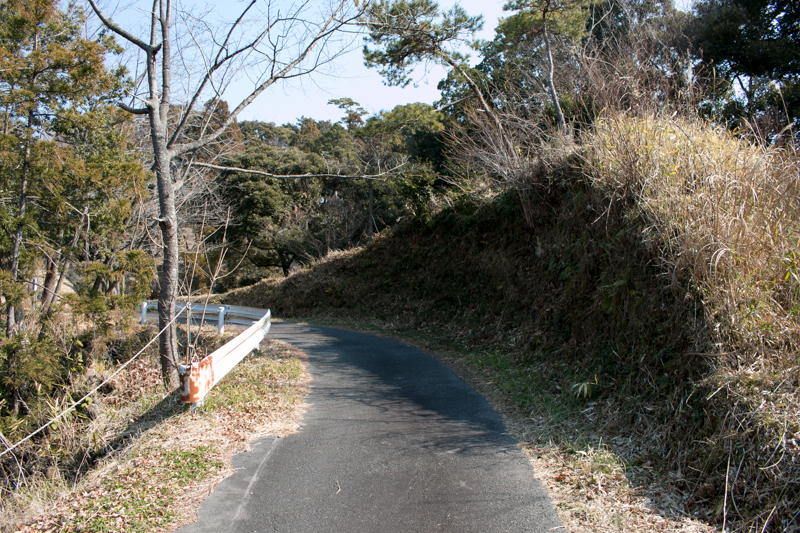 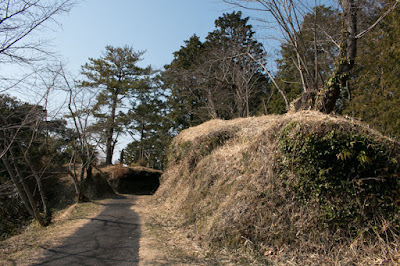 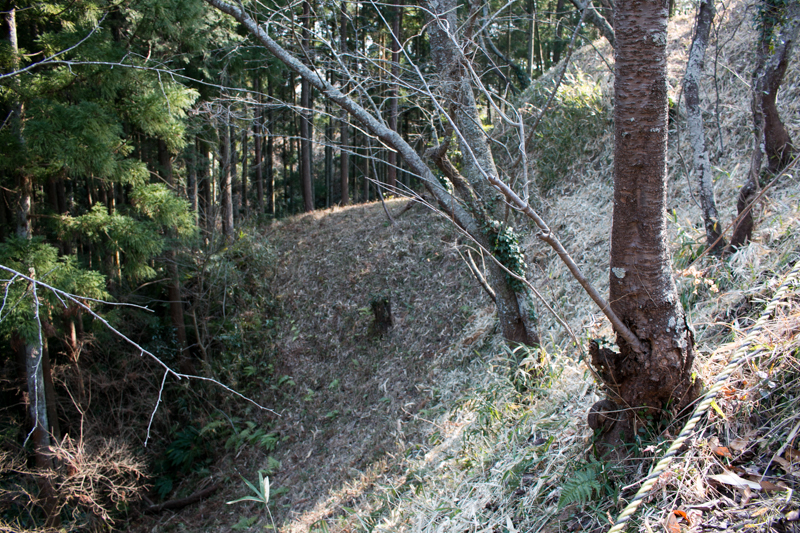 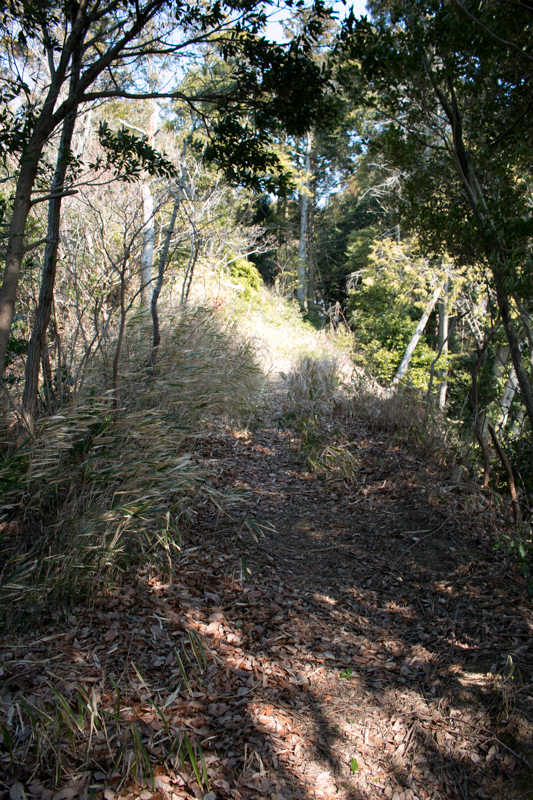 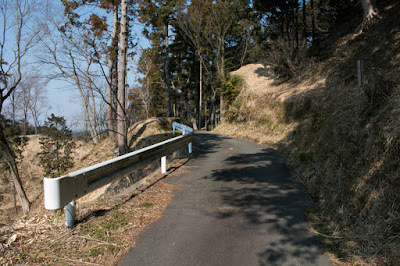 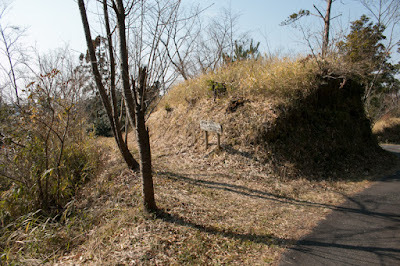 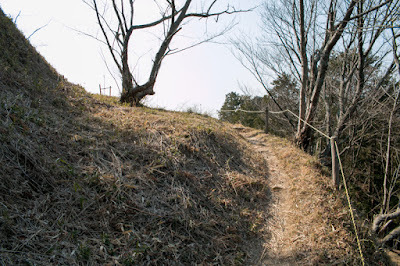 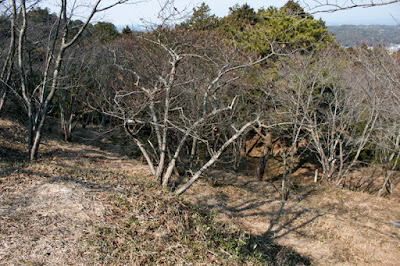 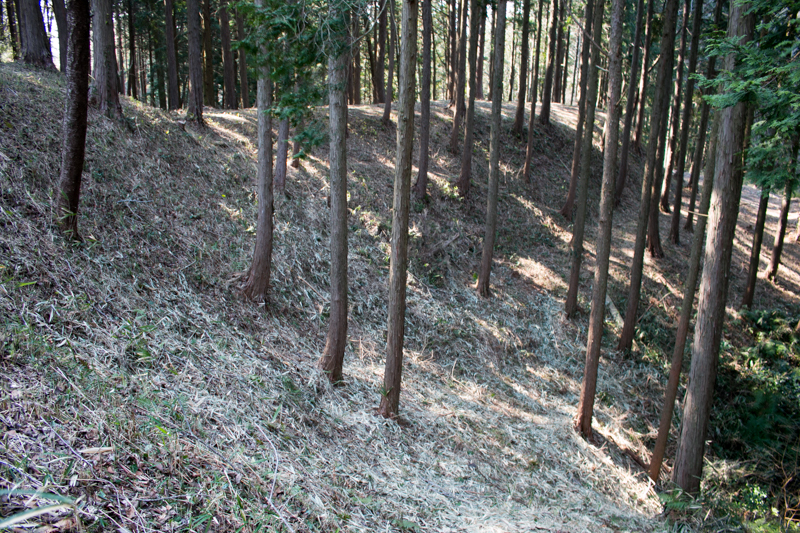 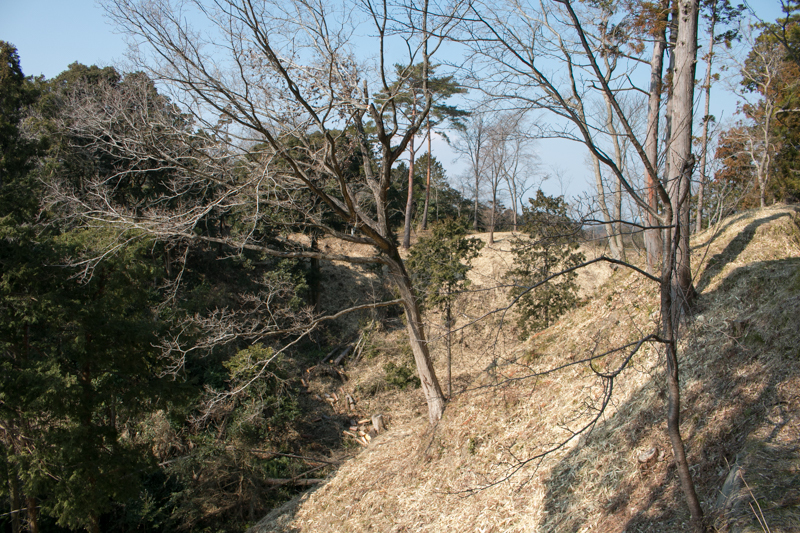 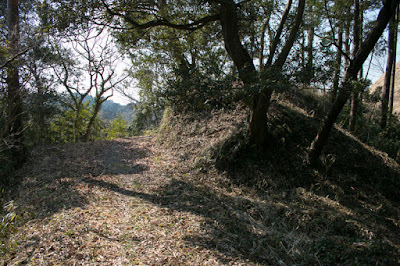 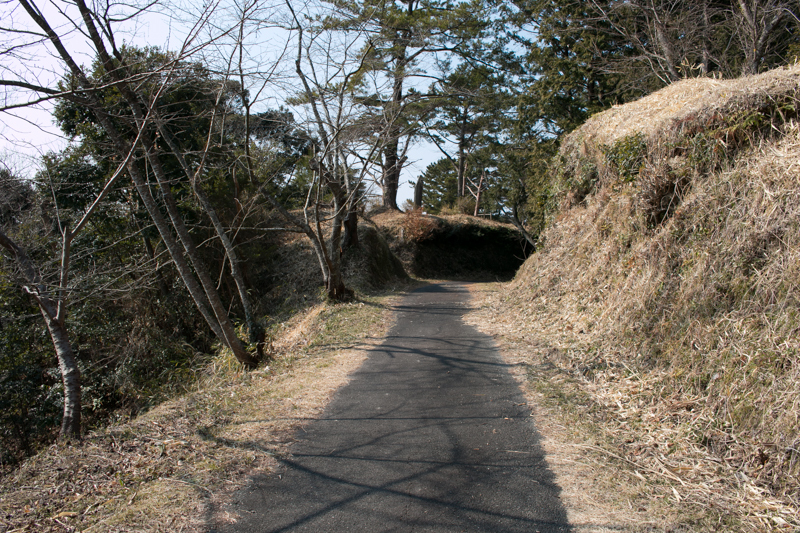 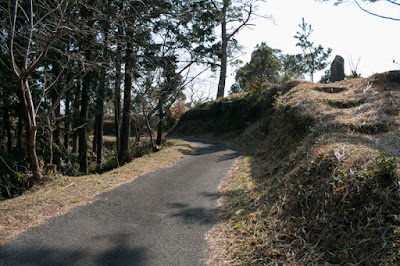 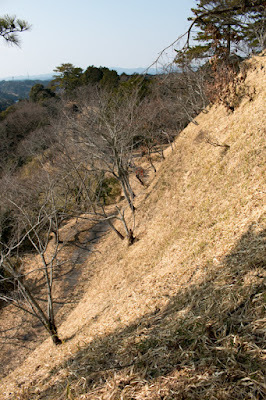 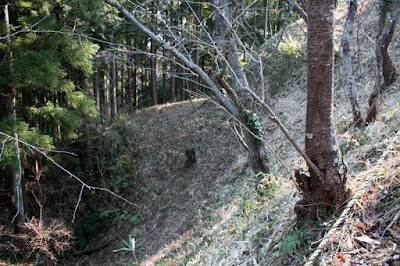 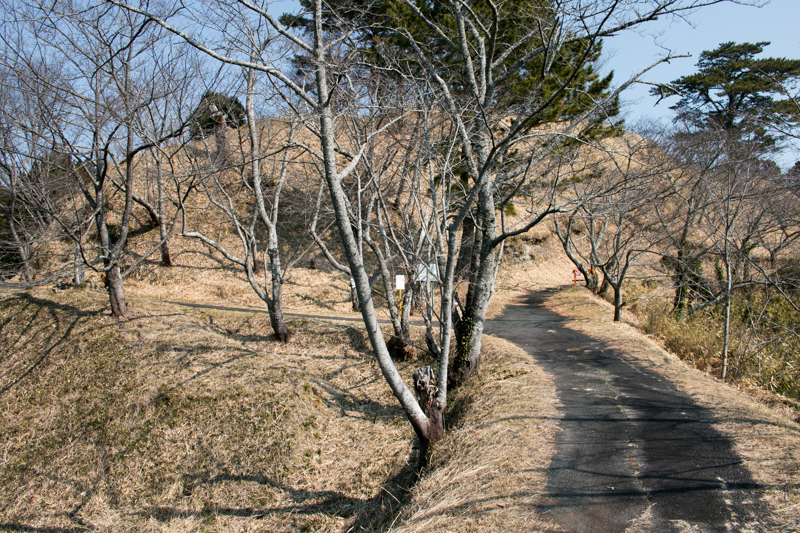 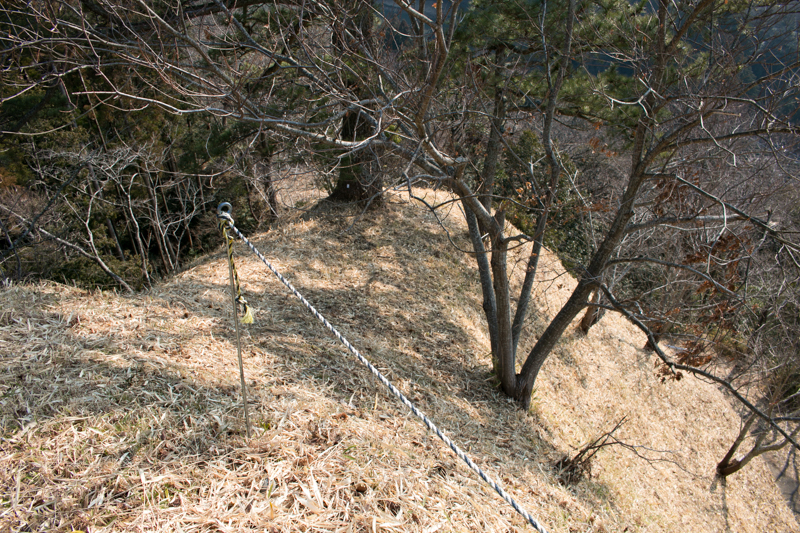 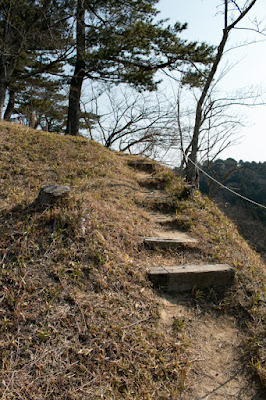 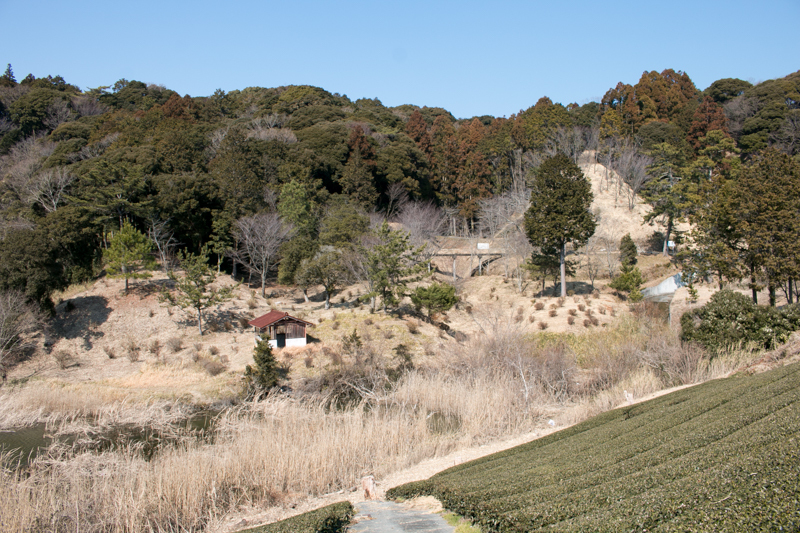 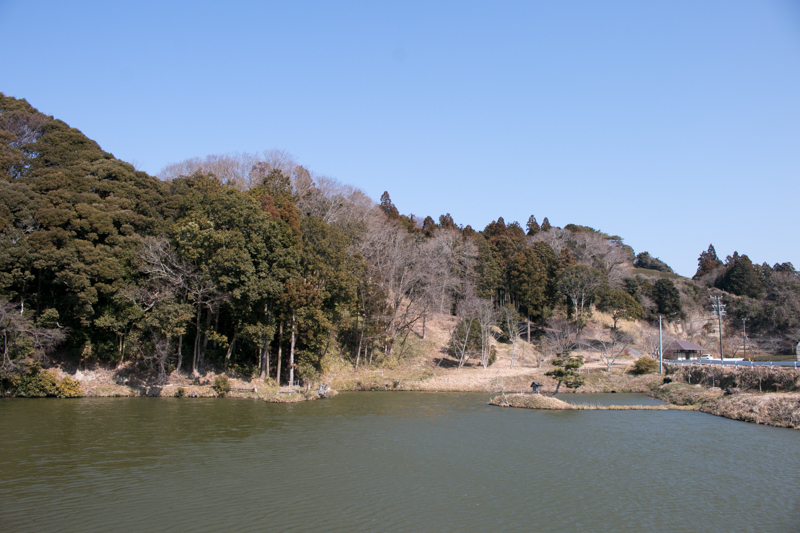 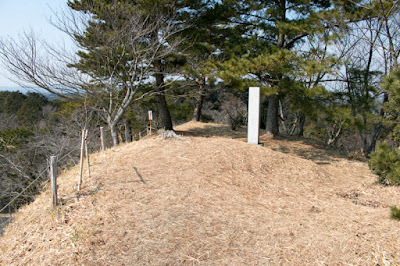 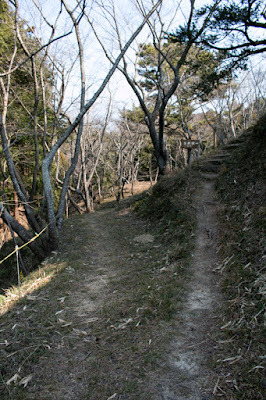 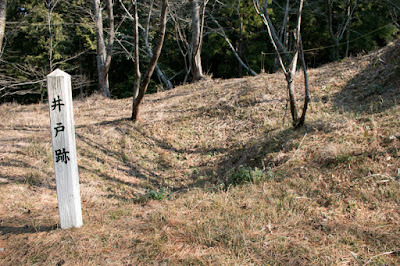 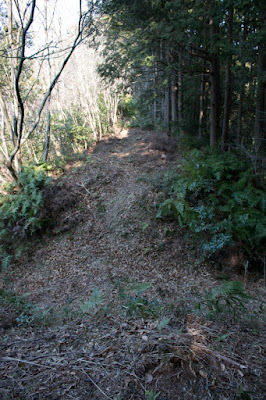 The eastern edge of eastern fort is a bottle neck point named “Ikki-gake” (one cavalry riding) connected to Makinohara height, and this part is securely protected by tall cliff with dry moat. 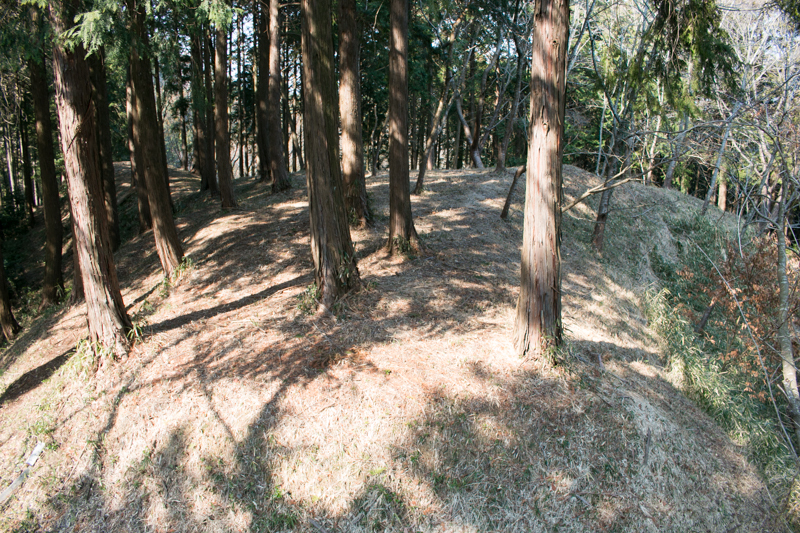 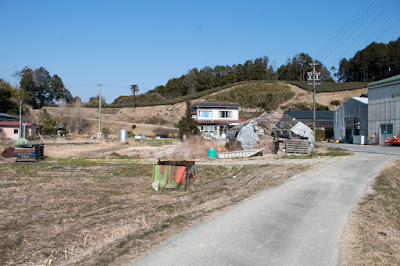 Contrary to eastern half, western half was a place of life consist of large flat areas where people of Yokoji clan or Shiba clan had their residence. 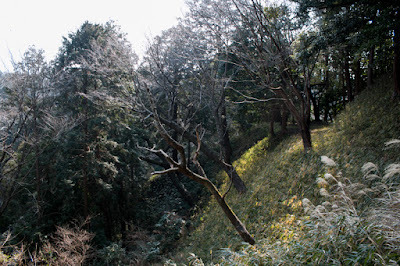 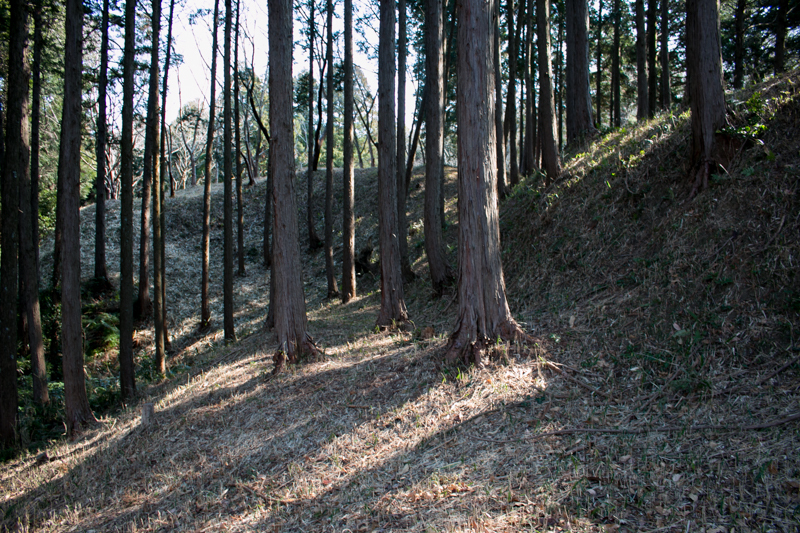 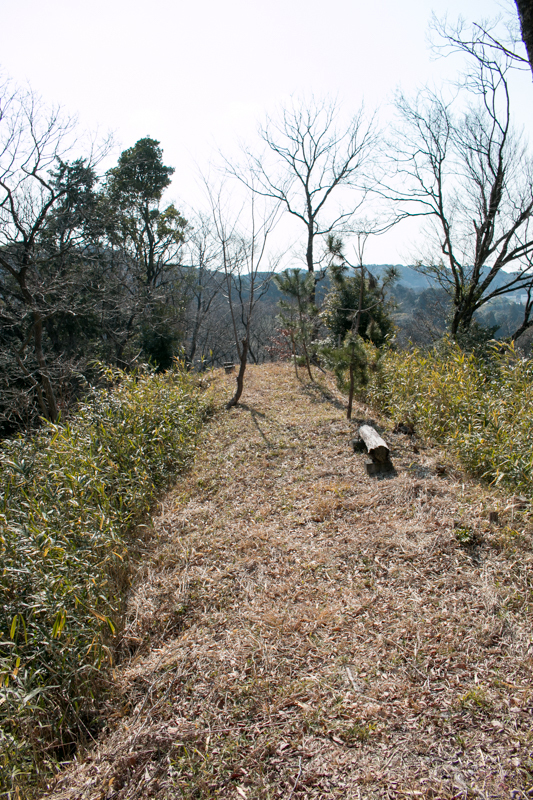 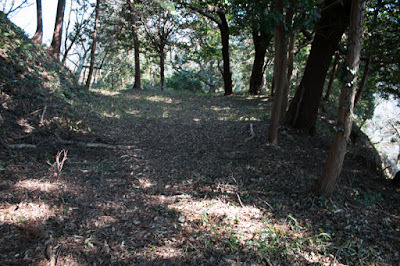 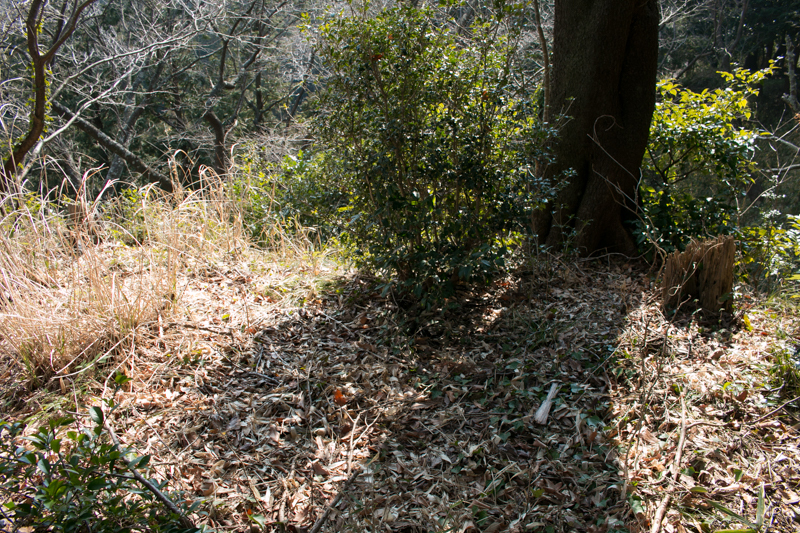 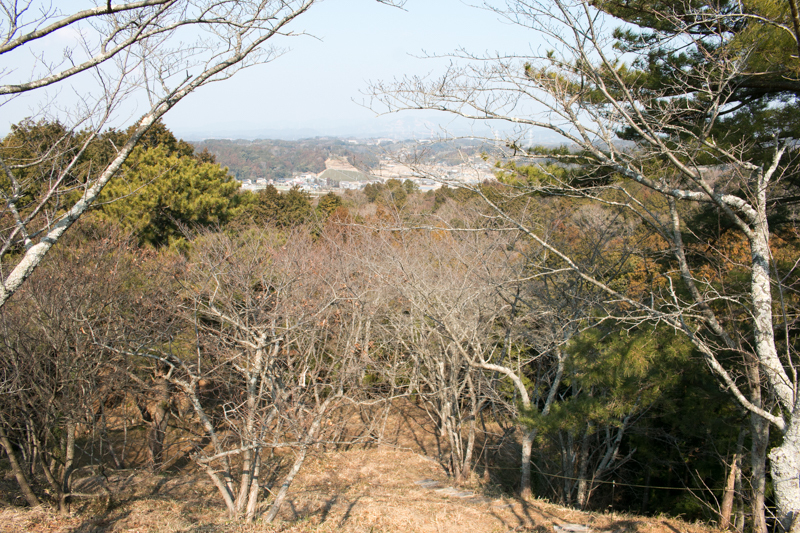 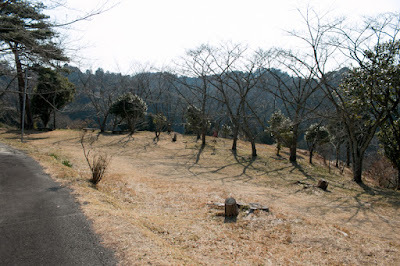 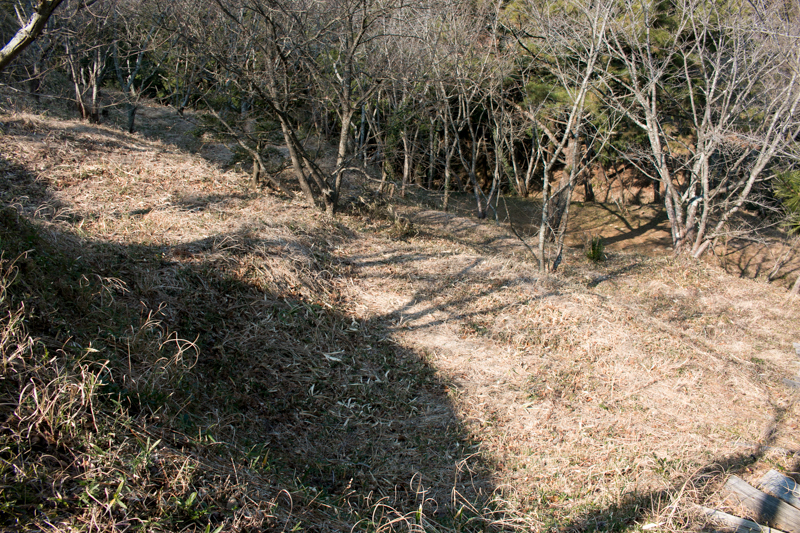 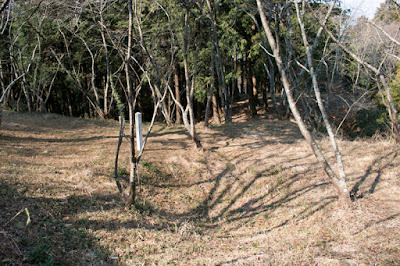 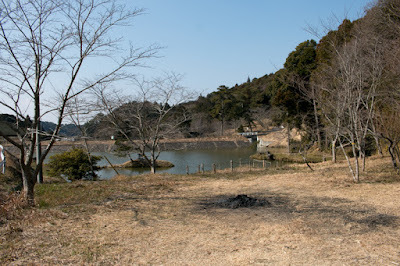 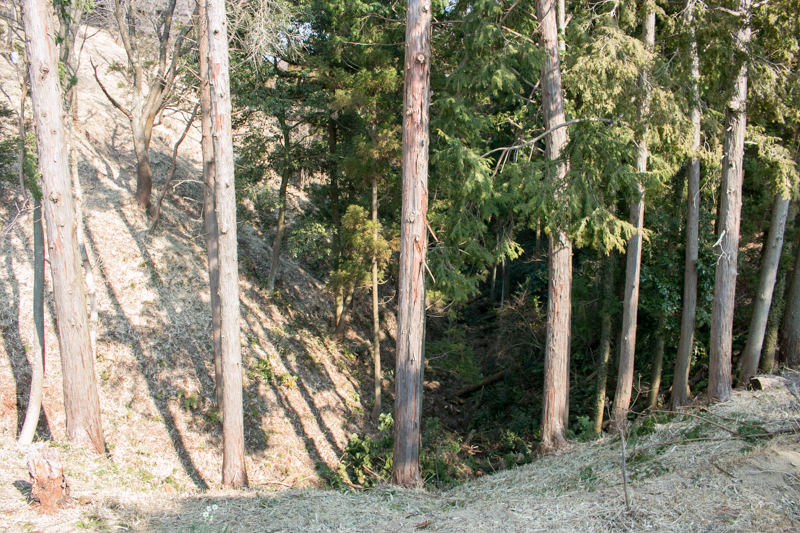 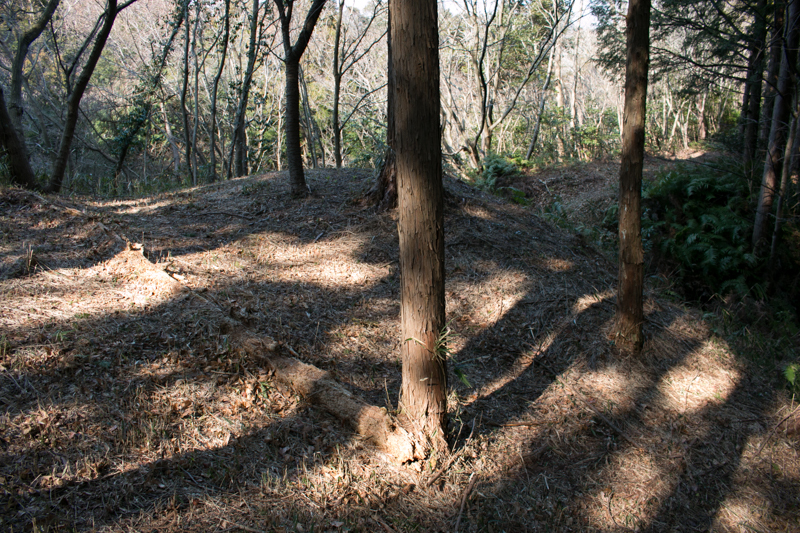 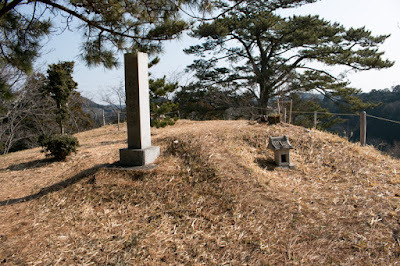 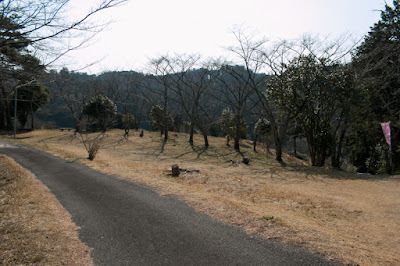 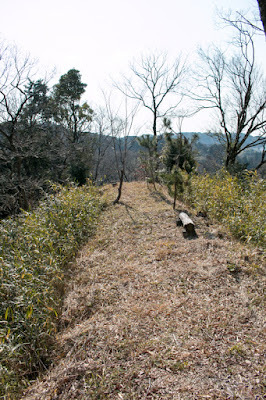 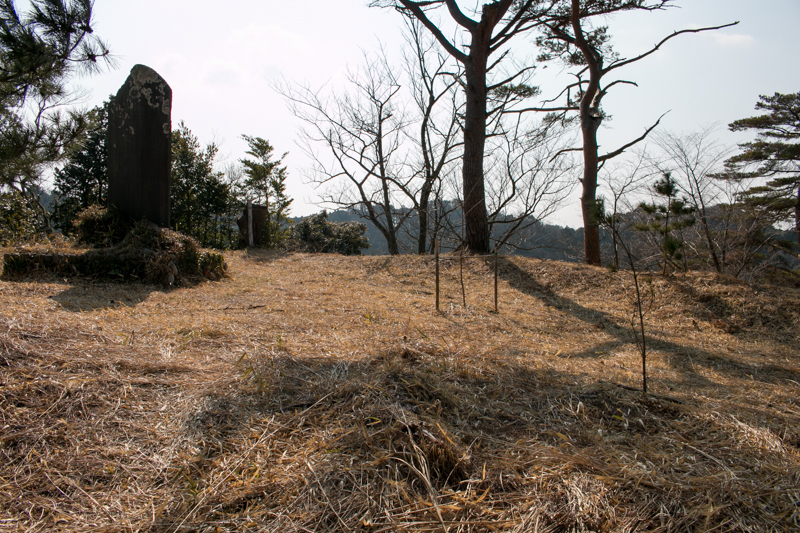 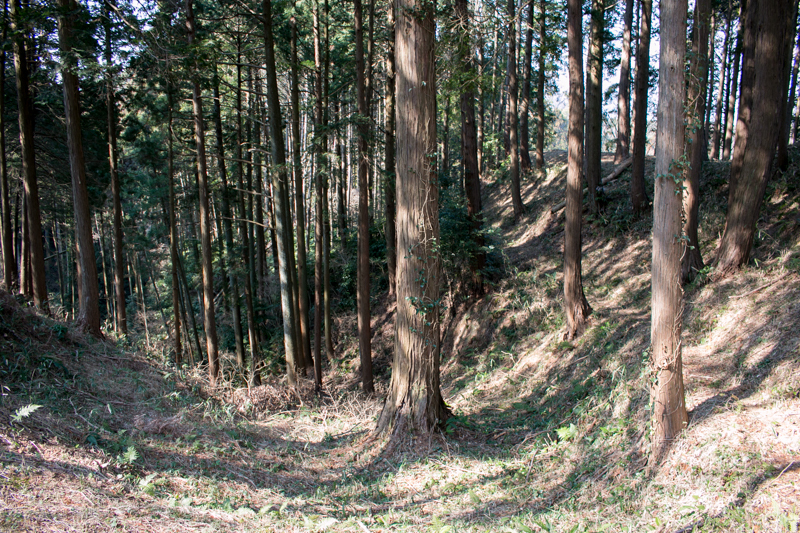 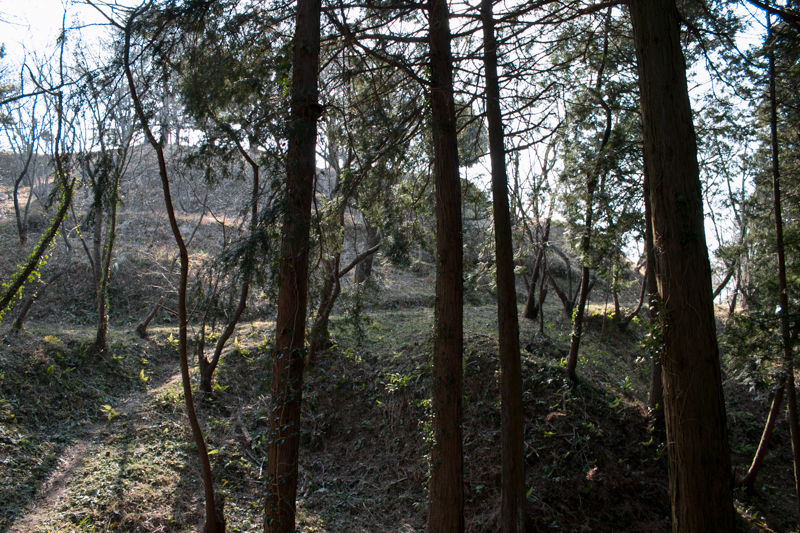 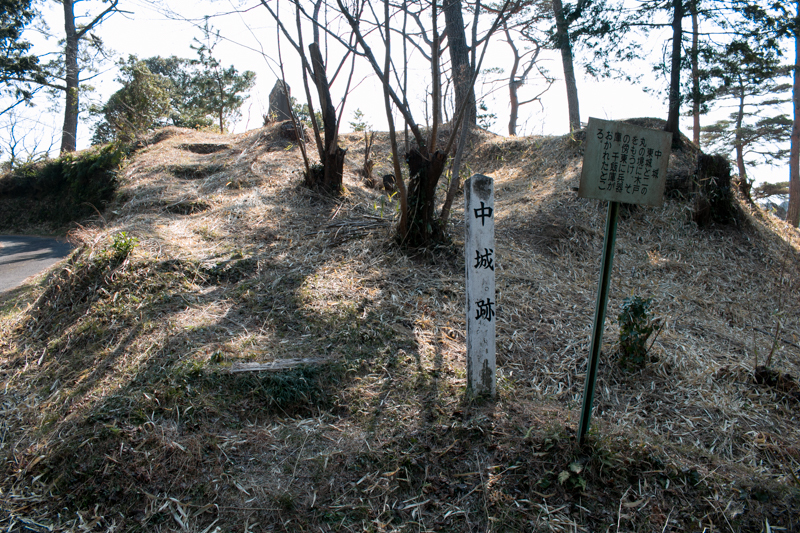 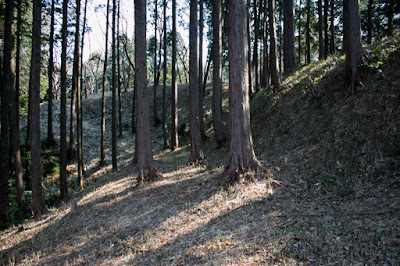 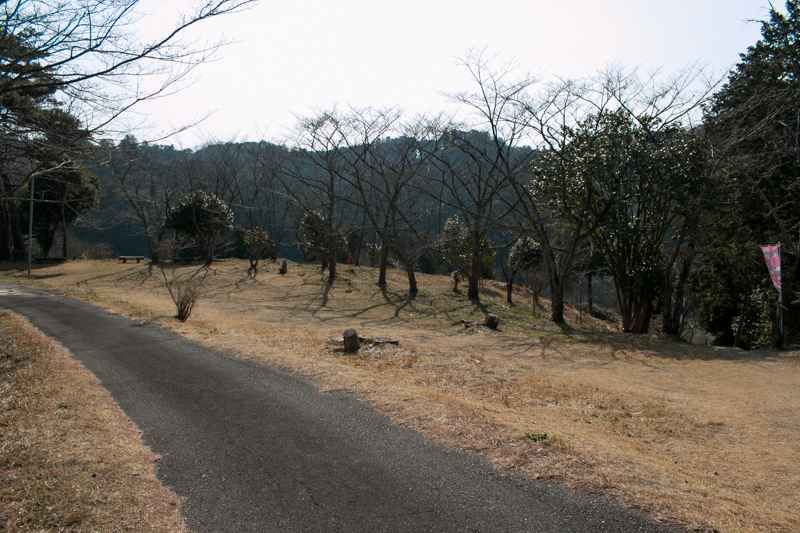 At the western hillside, there is a flat place used as a ground for residence of Yokoji clan, and surrounding castle hill there are many ruins of Yokoji clan such as tombs, clan temples or ponds. 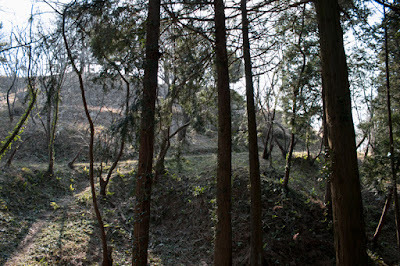 Total size of castle including residential area is about 500 meter long and 400 meter wide, and suitable as a main base of first class local lord of Totomi province. 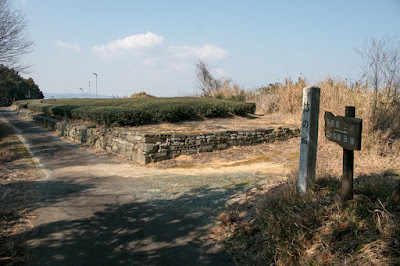 In the latter half of 15th century, the governor of Totomi province was shared with Imagawa clan and Shiba clan, but Shiba clan became hostile with Imagawa clan because of the battle of Onin and significantly declined. 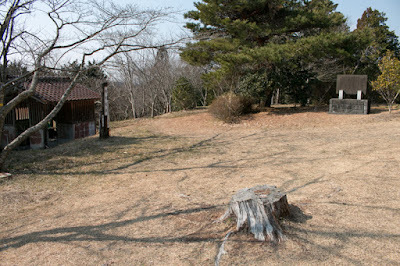 Looking at such situation, in 1465, Yokoji clan and Katsumata clan raised under the name of Shiba clan and captured the administrative base of Totomi province at current Iwata city from Imagawa clan. 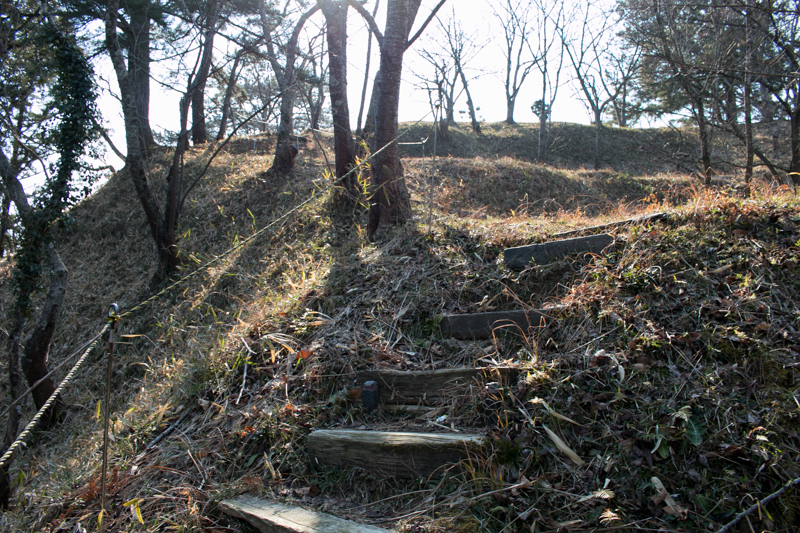 Yokoji clan placed the governor of Shina clam at Yokoji castle and once seemed to grasp Totomi province. 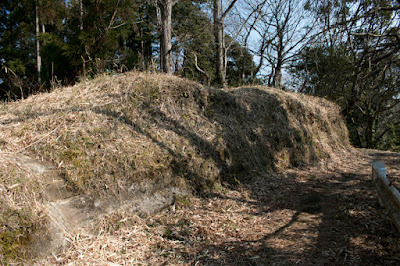 However, Yoshitada Imagawa (1436-1476), the main family of Imagawa clan at Suruga province, hoped to retrieve Totomi province and attacked Yokoji clan and Katsumata clan in 1476. As the territory of Yokoji clan and Katsumata clan was just at the next of Suruga province, both clan could not respond to sudden attack of Imagawa clan. After seven days siege, Yokoji castle fell then Yokoji clan was ruined along with Katsumata clan. 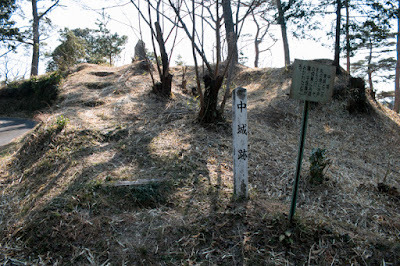 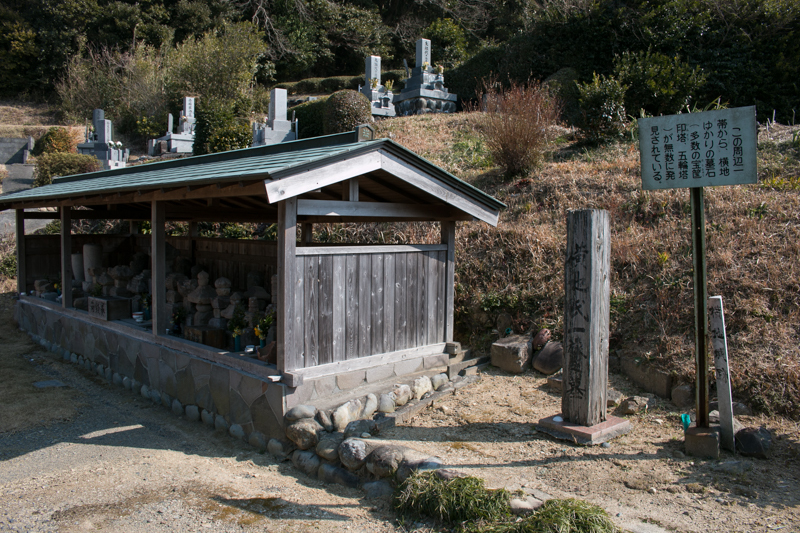 But on the way to return, Yoshitada Imagawa was assaulted by retainers of Yokoji clan who hoped revenge at the south of Yokoji castle, and was shut by arrow and died. 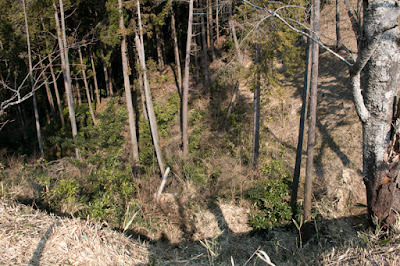 In Japan making a revenge is expressed by returning blow by arrow, and exactly this happened. 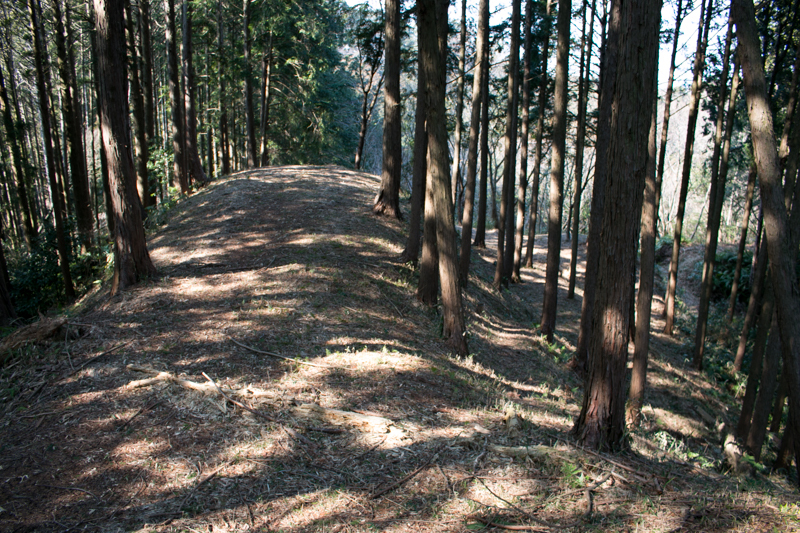 Imagawa clan once fell into disorder and interrupted advance into Totomi province. 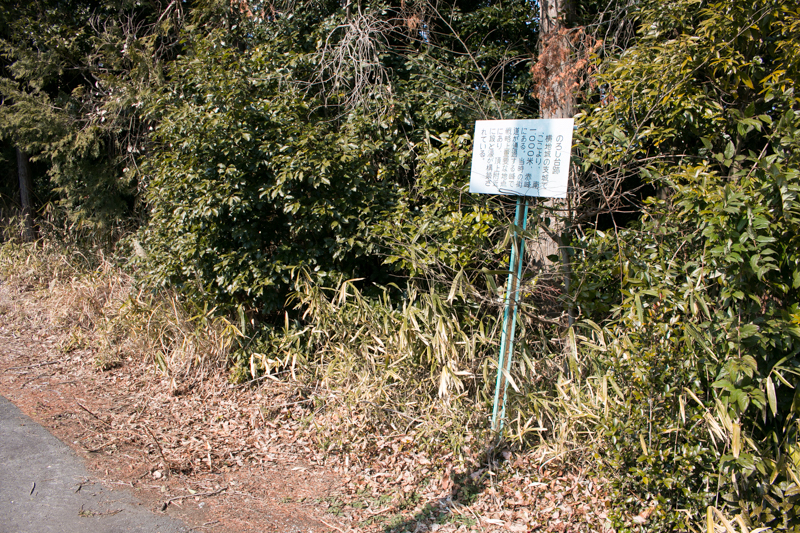 But Ujichika Imagawa (1471-1526), the son of Yoshitada and who was supported by Soun Hojo (1432-1519), the founder of Hojo clan, fixed the situation and intruded into Totomi province again. 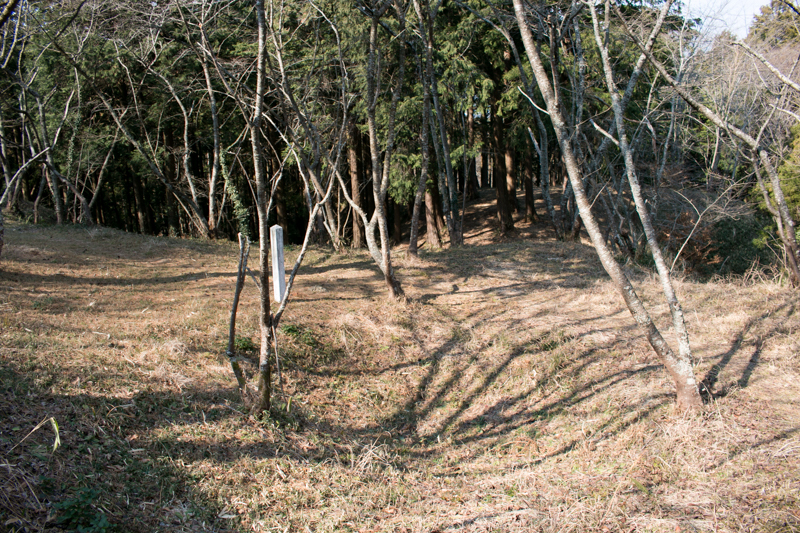 Imagawa clan captured Totomi province by 1500, and Yokoji clan failed to restore the clan then became the forgotten clan. As Imagawa clan built Kakegawa castle as their local base in the eastern part of Totomi province, thus Yokoji castle was also abandoned. Now no building remains but shape of terraces still remain over the castle hill. 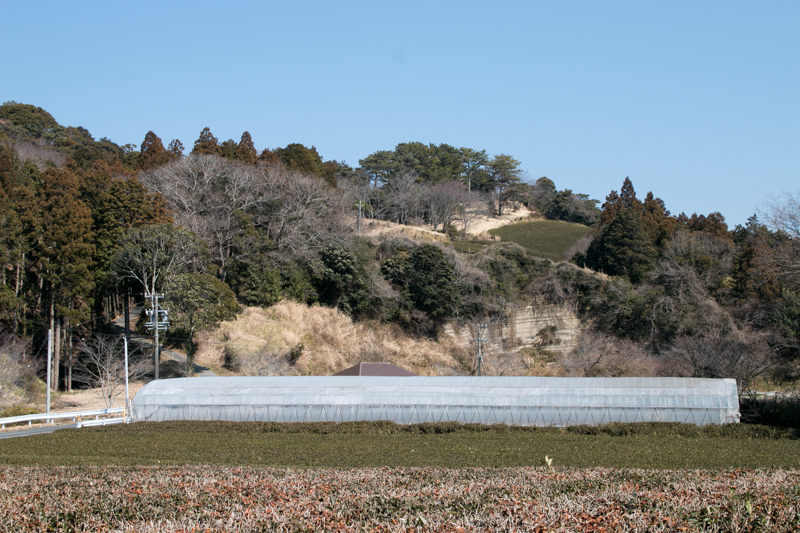 Large flat space and clear shape of terraces considering its build in early year shows authority of Yokoji clan as an important local lord at this area. 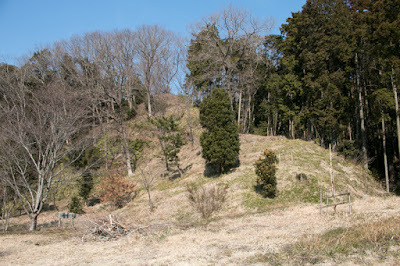 As Yokoji castle was abandoned with the ruin of Yokoji clan, castle site still keeps the atmosphere at the perild of Yokoji clan. 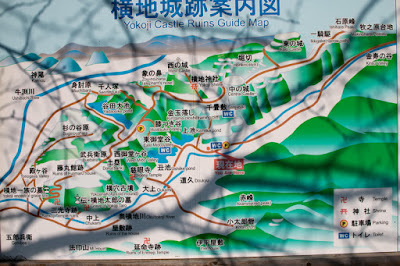 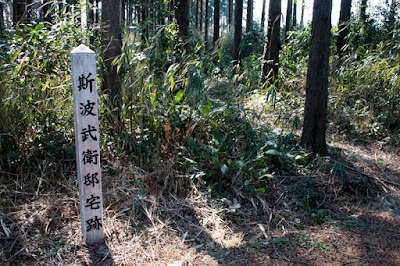 Various place names relating castle and Yokoji clan around the castle and ruins clearly conveys the image of distinguished medieval clan disappeared into the history. 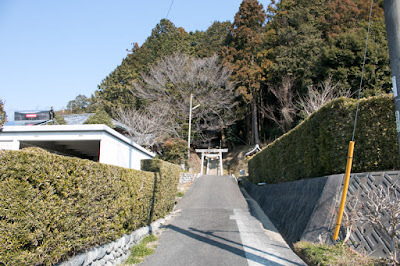 20 minutes walk from Yokochi Shogakko Iriguchi bus stop of Shizutetsu Justline bus departs JR Central Tokaido Honsen line Kikugawa station toward Hamaoka bus station. 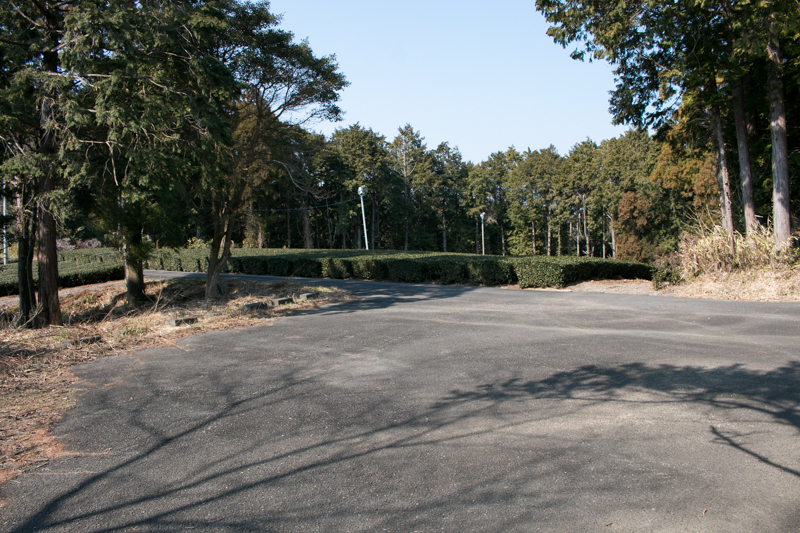 15 minutes drive from Tomei Expressway Kikugawa interchange.